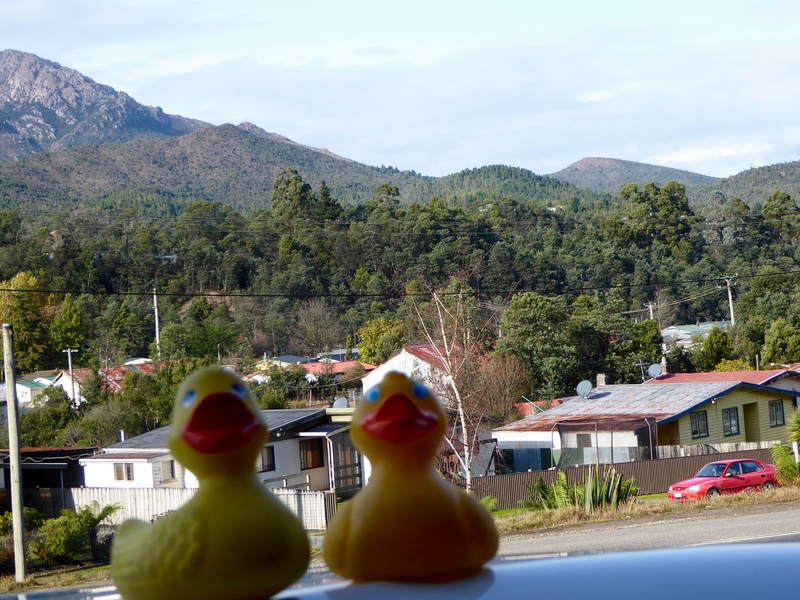 Zeb and Eider Duck, with humans, leave Burnie, Tasmania for a long drive. 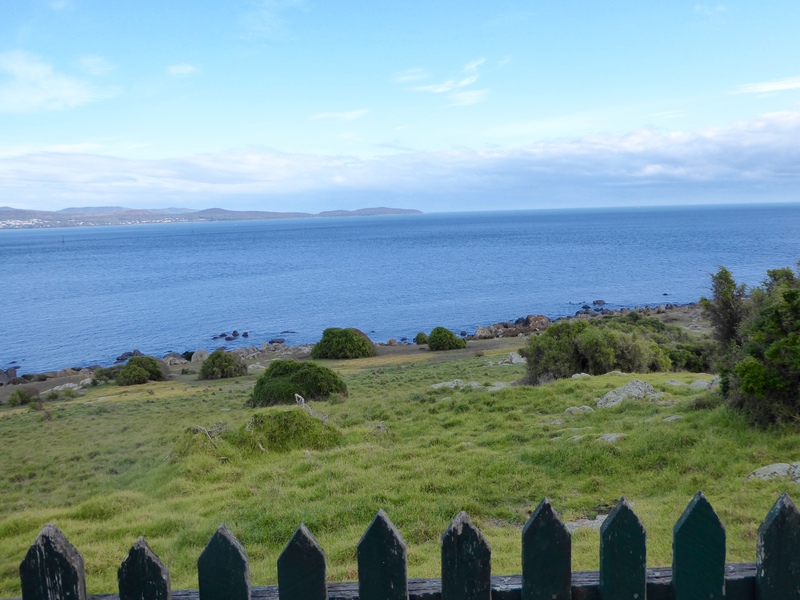 We want to see the western part of Tasmania, but we have to return our car tonight, in Hobart. It is pretty cold today. The valleys have fog. near Roseberry. 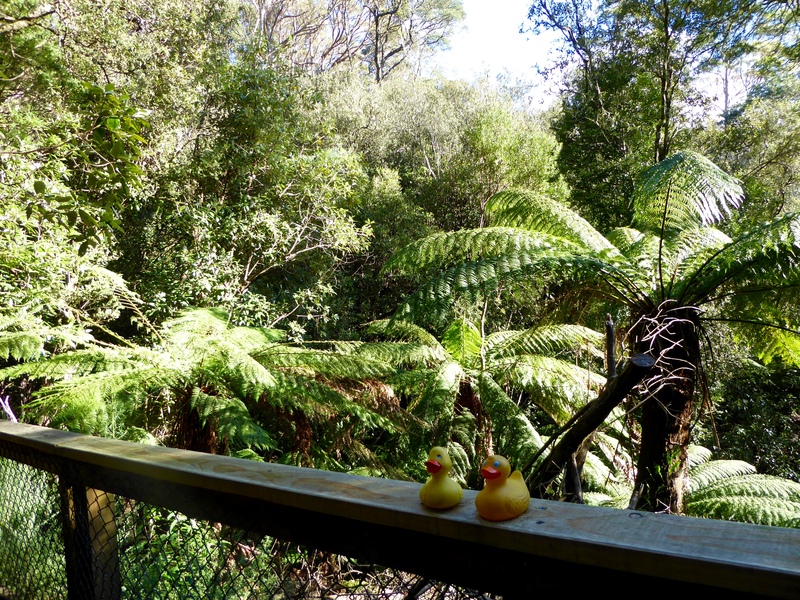 We like the rainforest. 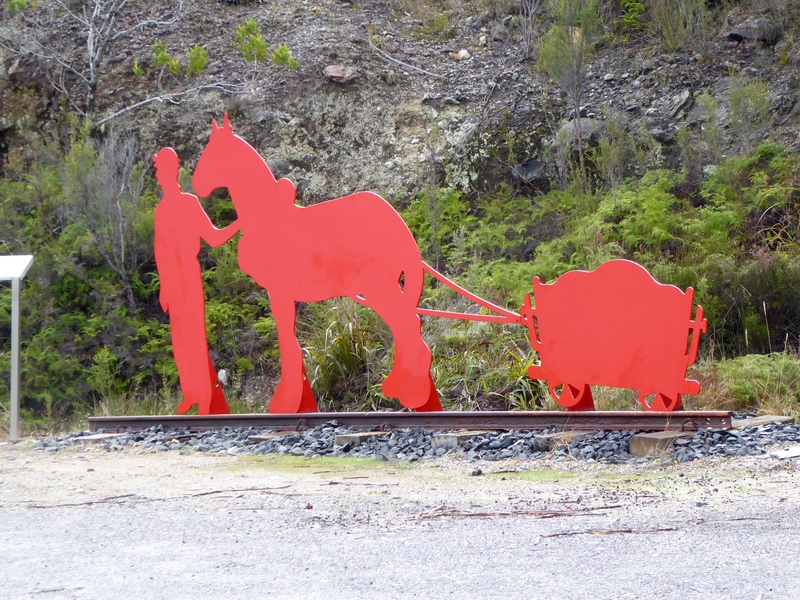 We are now in a mining area of Tasmania. 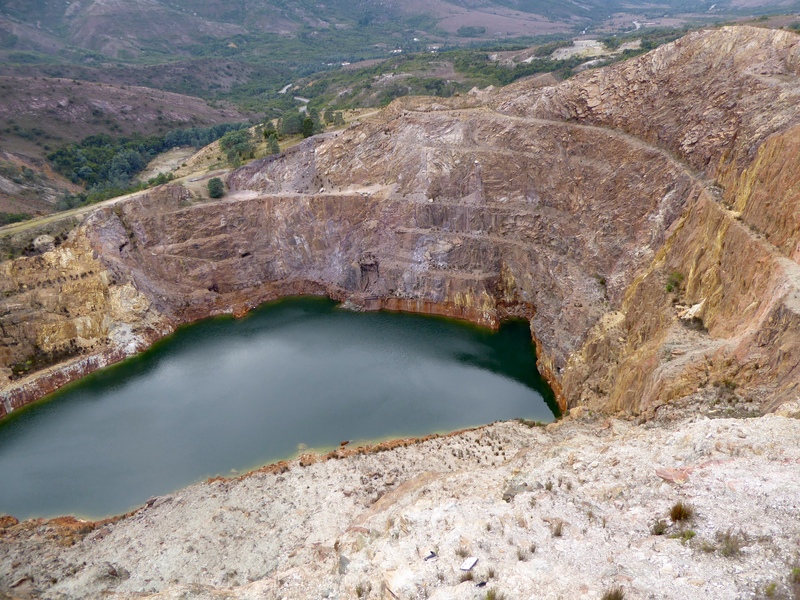 In the late 1800s gold, silver and copper were mined here. 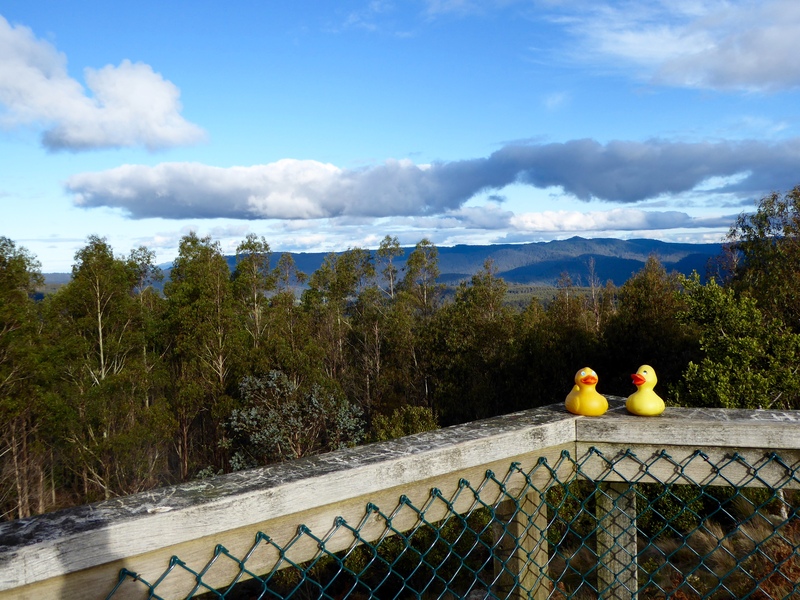 We stopped at this lookout. We looked down into the mining area. Looking ahead we see fresh snow on the mountain. Mom is going to put us in the snow. We stopped at the East West Divide. The snow has just about stopped. 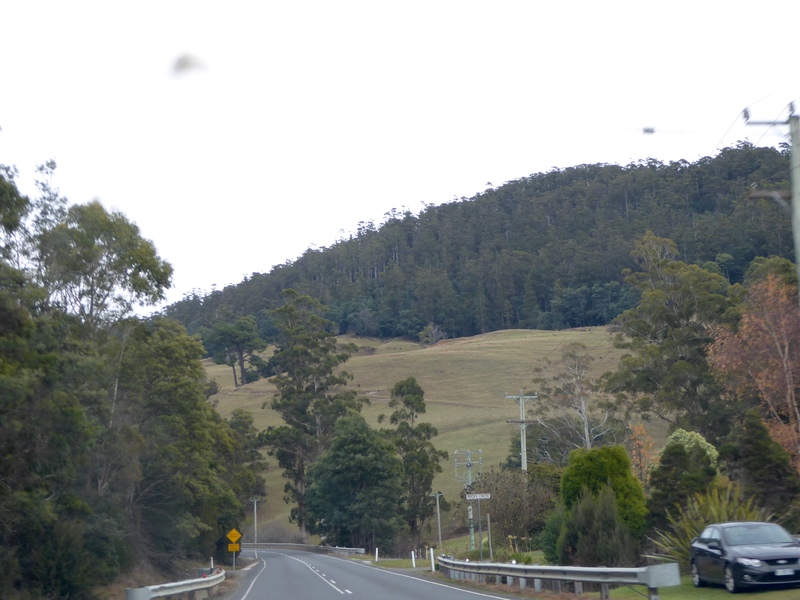 Coming out of the mountains, we really like this green, hilly landscape. So much change in the land in so few miles. 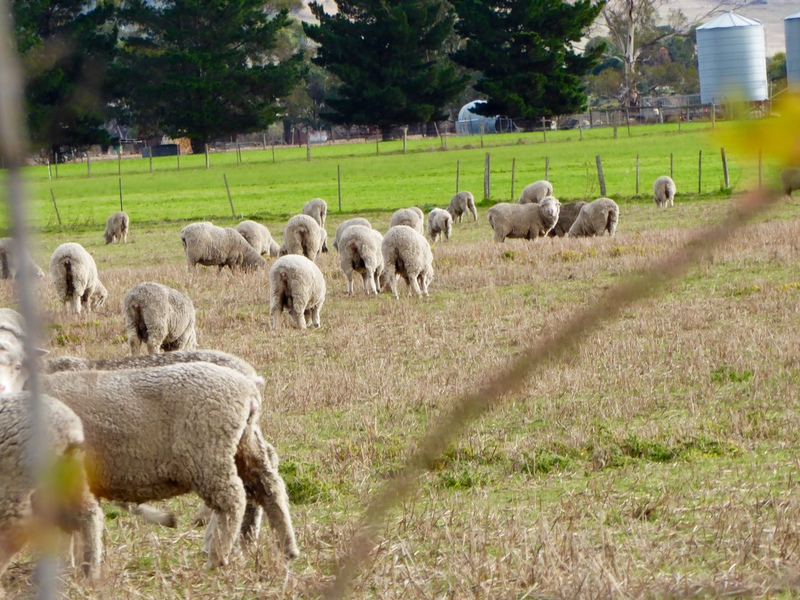 We still see flocks of sheep, but we also see many herds of cattle. 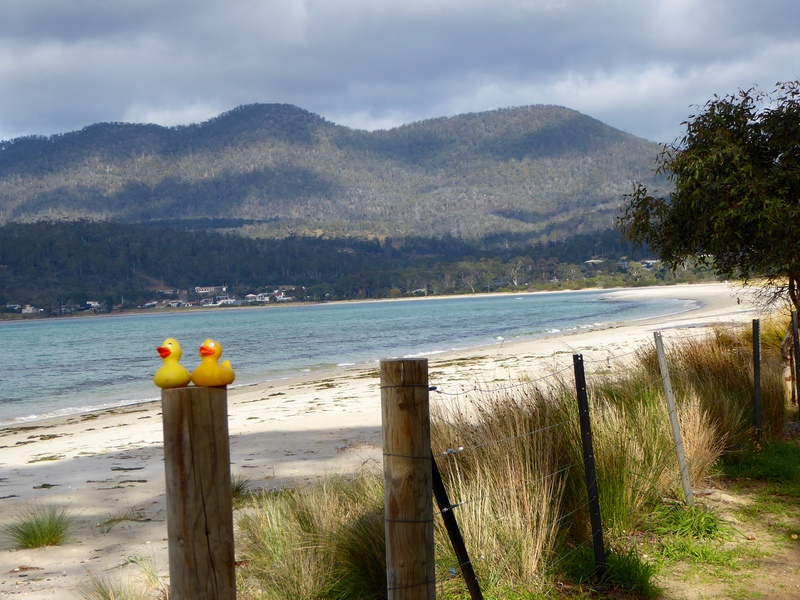 We really like Tasmania. The scenery is breathtaking and the people are very friendly and helpful. 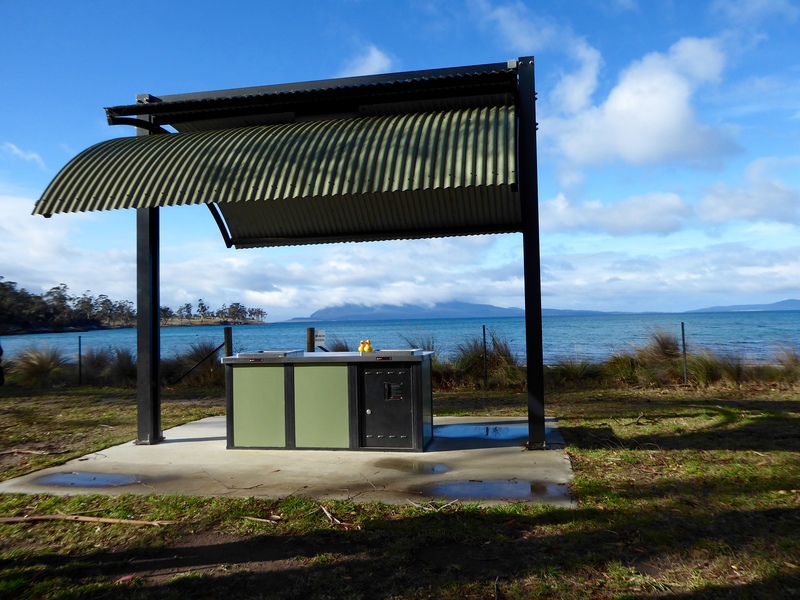 This is an island for hiking, camping and enjoying the outdoor lifestyle. 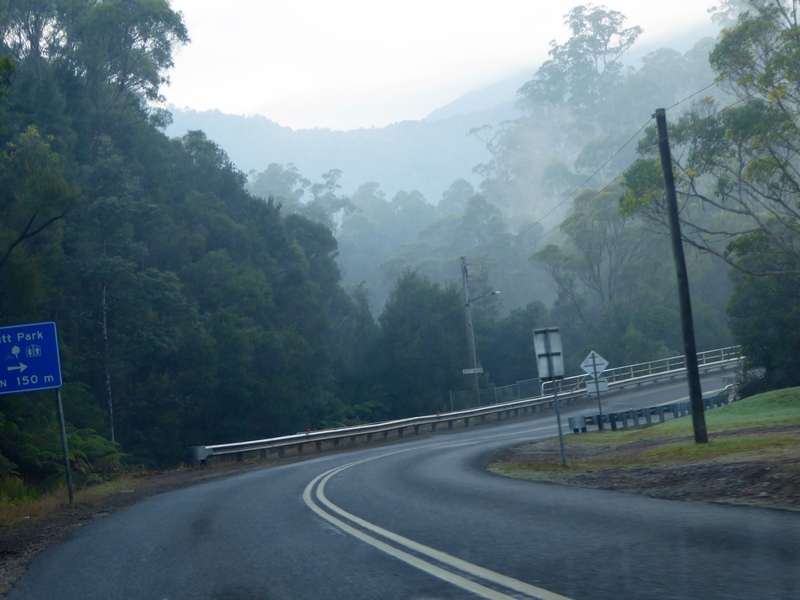 However, we want to caution you that the roads are rather narrow with so many curves. Most of the roads we found were rather narrow and had many curves. Beautiful but be careful! If you have a camper you may find driving difficult, so please be careful. 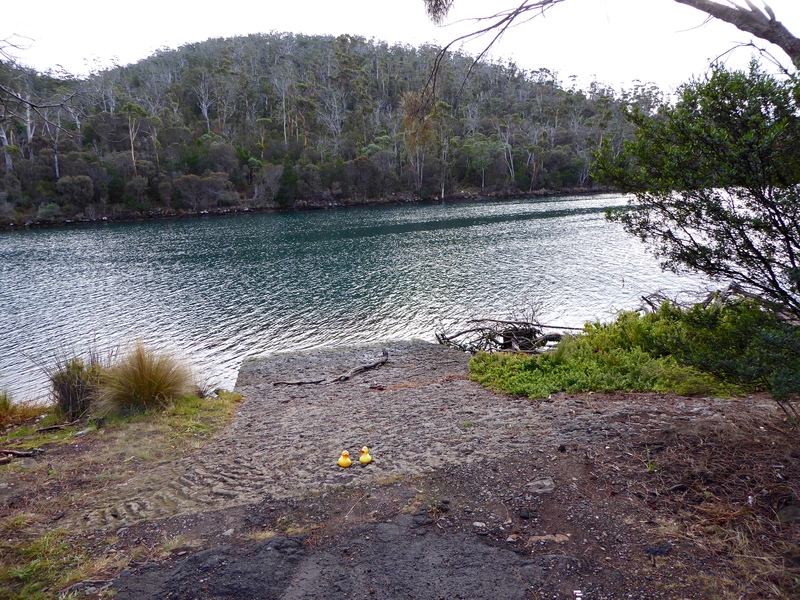 This is our last day in Tasmania. 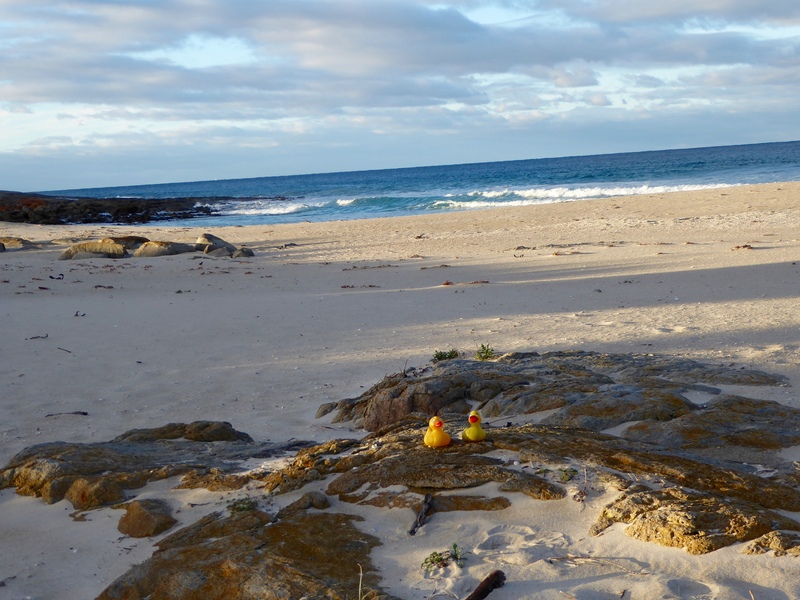 We will miss it, but we are eager to explore other parts of Australia. 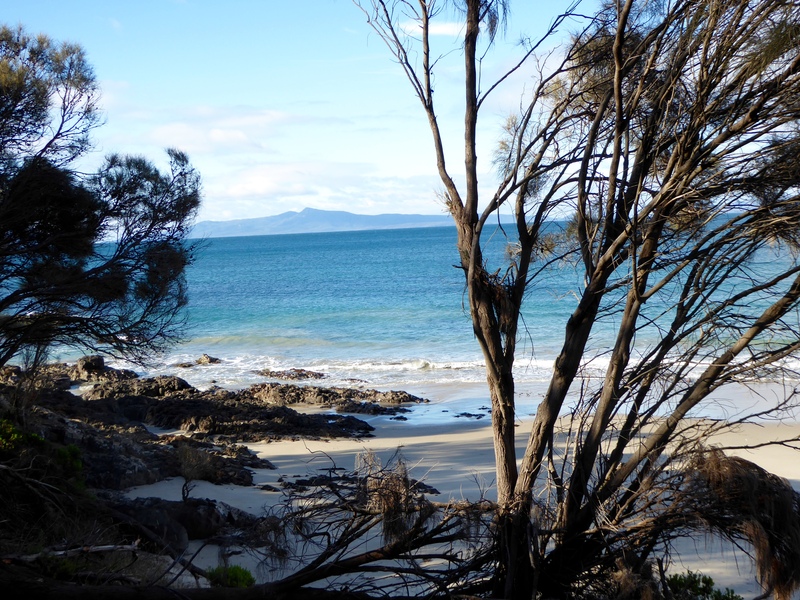 Yesterday we admired the white sand and clear blue water of the Bay of Fires and marveled at Tasmania’s tallest waterfall, St. Columba Falls. This is such a beautiful island. 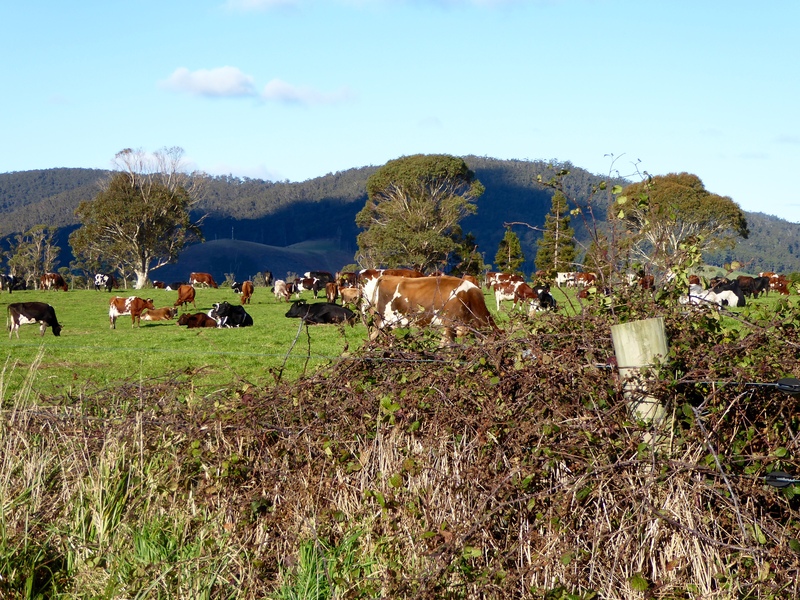 Continuing along the north coast of Tasmania, we saw more flocks of sheep, but we also saw herds of cattle. We think the rolling green pasture land and fields are beautiful, especially with the mountains in the background. Our next stop was Little Plains Lookout on our way to Scottsdale. 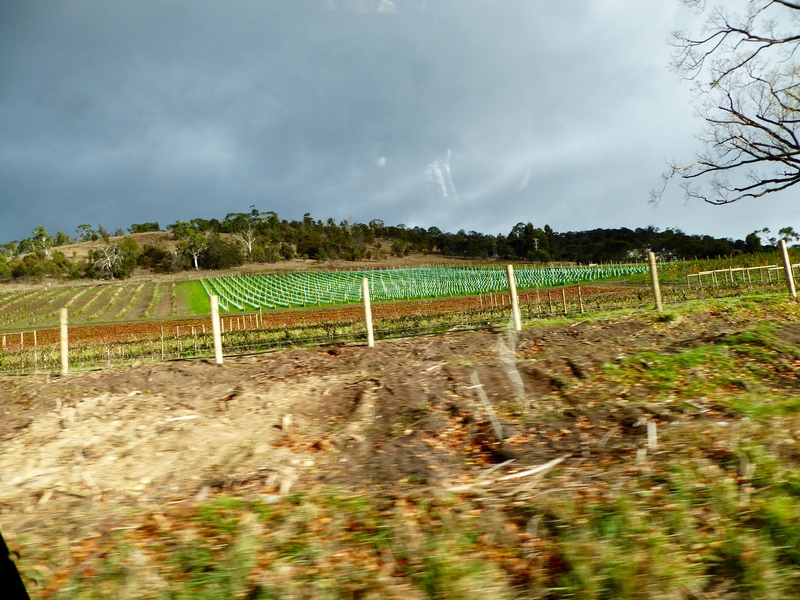 Tasmania is repurposing this land, planting hardwood trees which will be harvested in 2025. These will be used primarily for hardwood timber and veneer products. The residue, not suitable for sawlogs, is used for pulp. 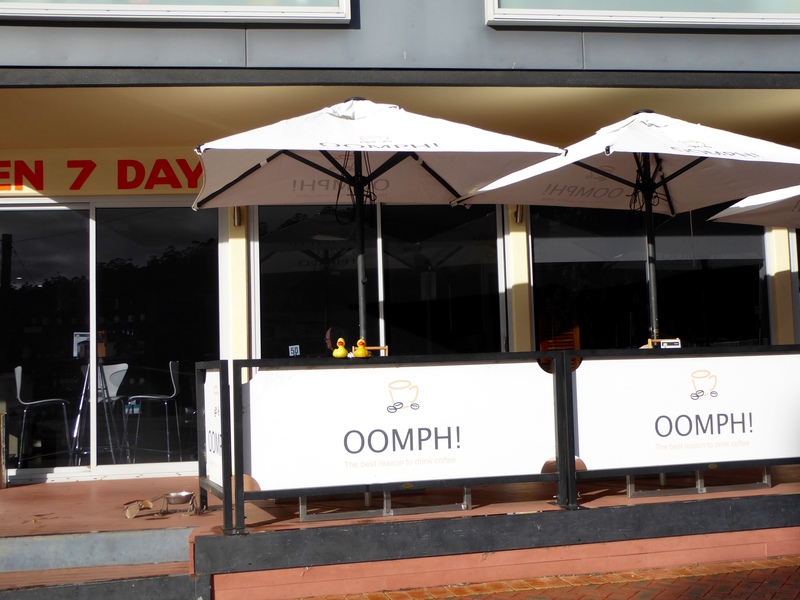 In Colorado we do not see many stores called bottle shops, but we did in Tasmania. 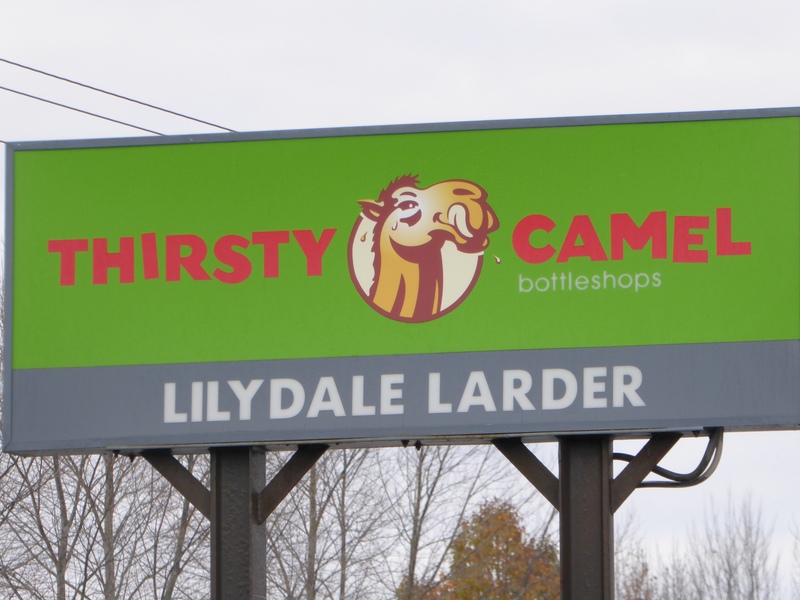 This was our favorite brand of bottle shop. 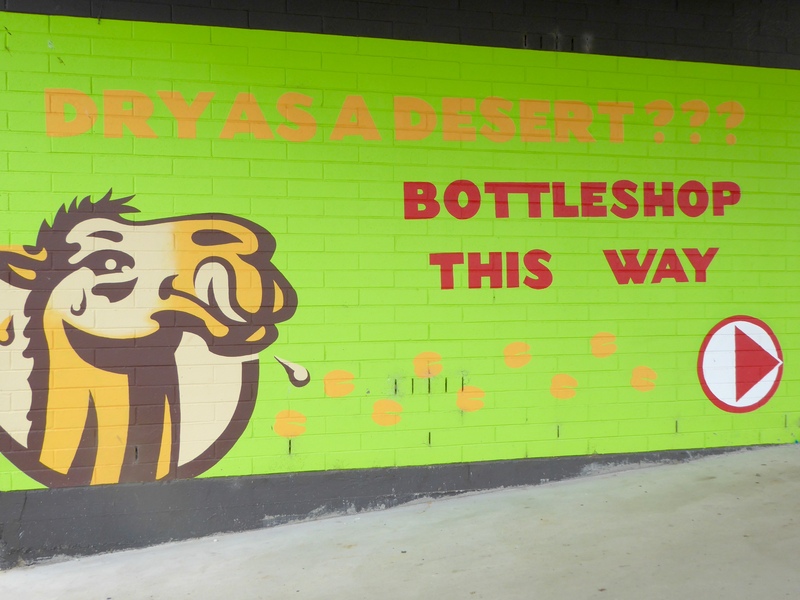 This Thirsty Camel Bottleshop is in Lilydale, Tasmania. We like the camel. 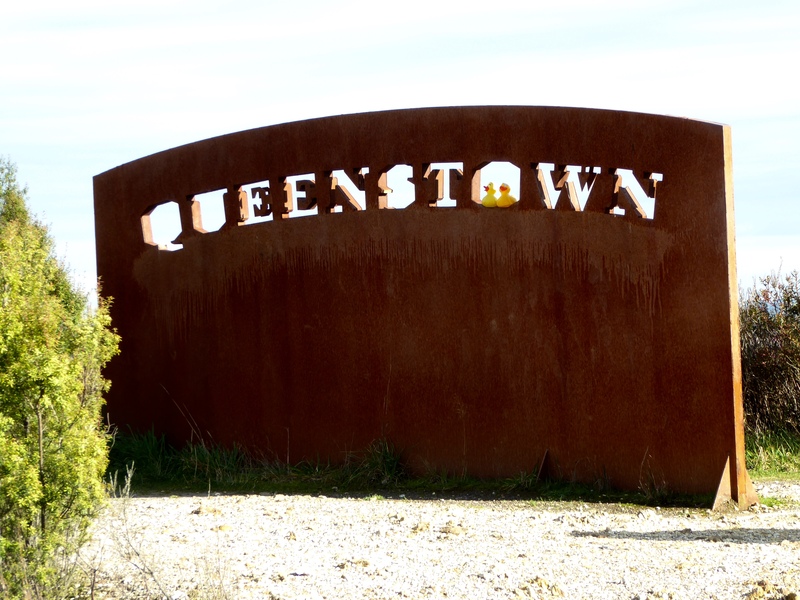 Continuing our exploration, a few kilometers north of George Town, we enjoy Low Head Historic Precinct. This is the ship’s bell, standing by the octagonal chart room. This is a recovered wooden marker buoy. These buoys are used to mark channels and other hazards. 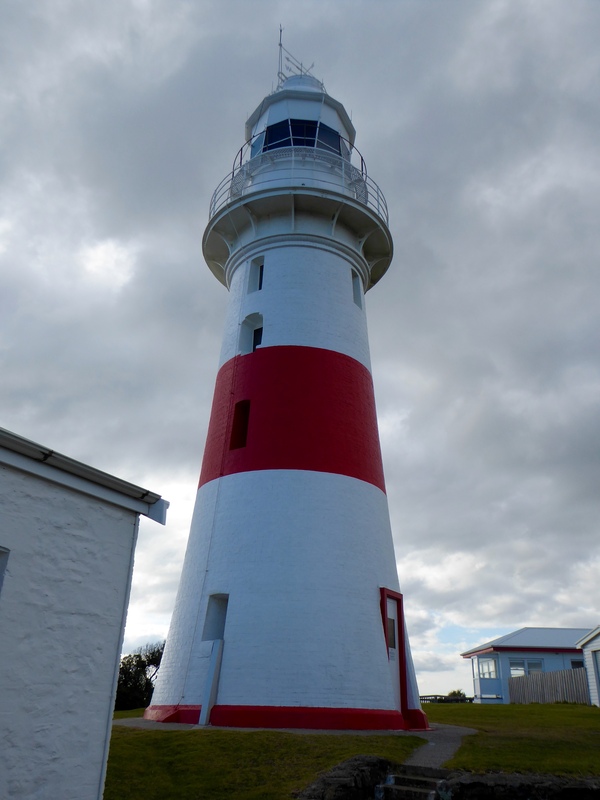 Here is the Low Head Lighthouse. 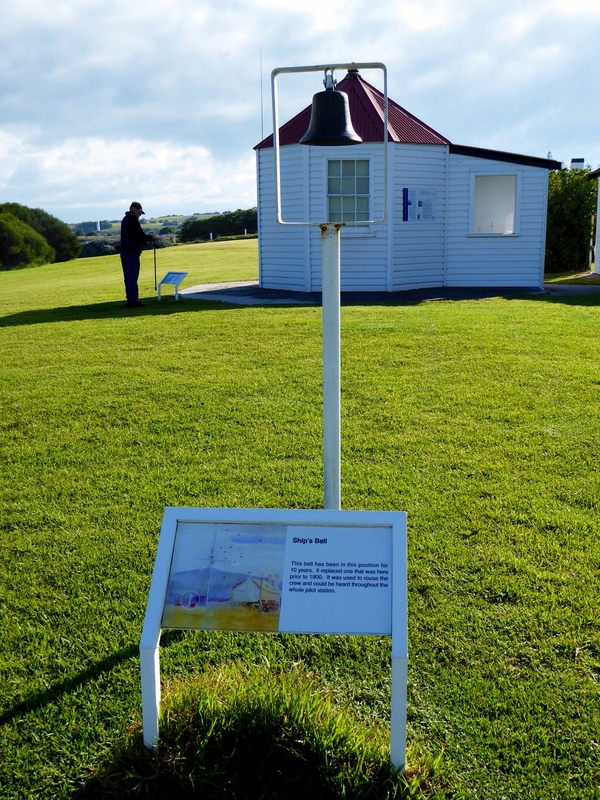 This view from the keeper’s cottage shows why the lighthouse is needed here. 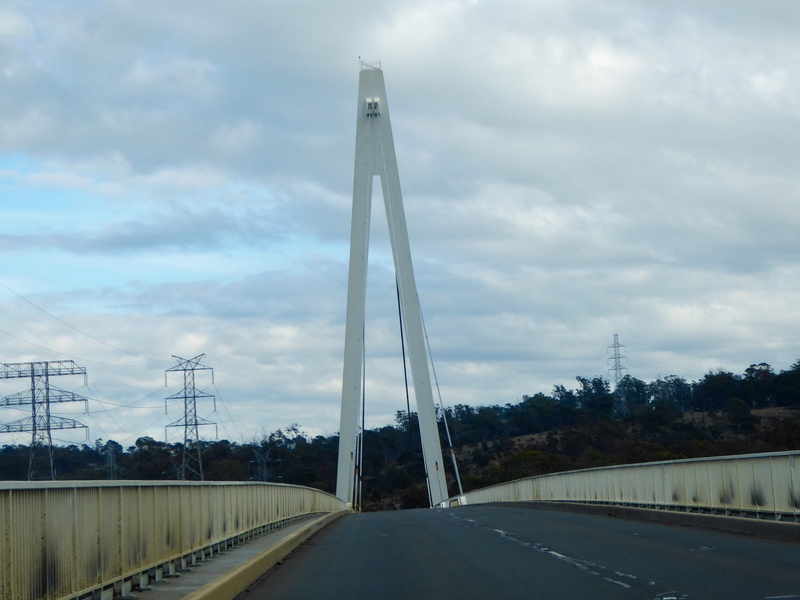 Continuing our journey, we are on the Batman Highway, where we encountered Australia’s first cable-stayed bridge. 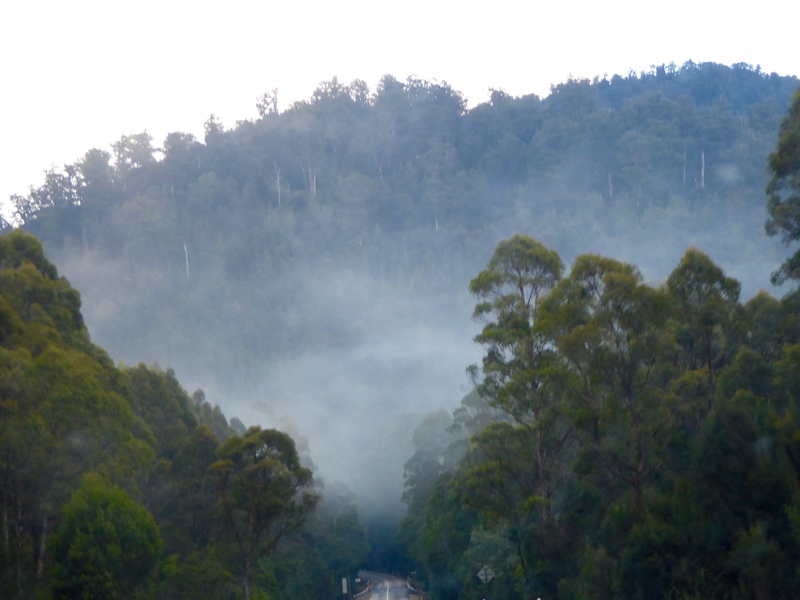 This is Batman Bridge in Sidmouth, Tasmania. 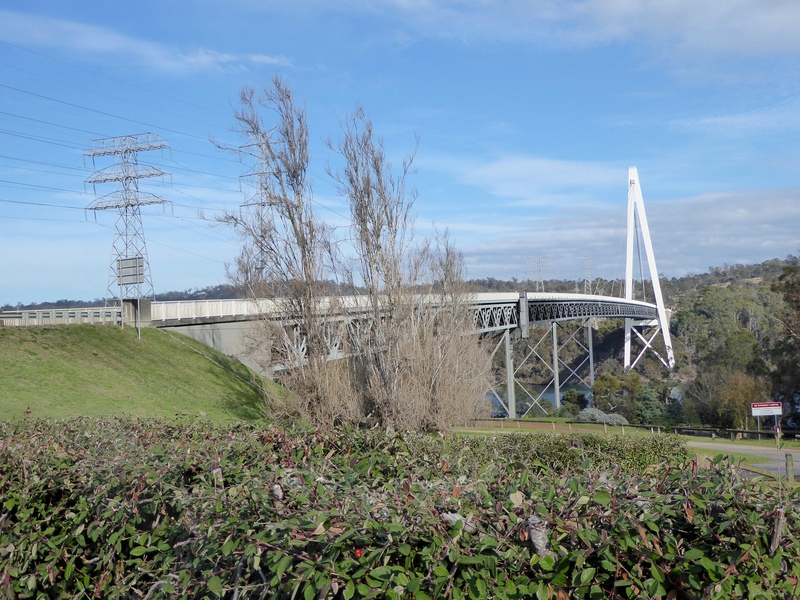 Batman Bridge spans the Tamar River. where we were greeted by this colorful bird. 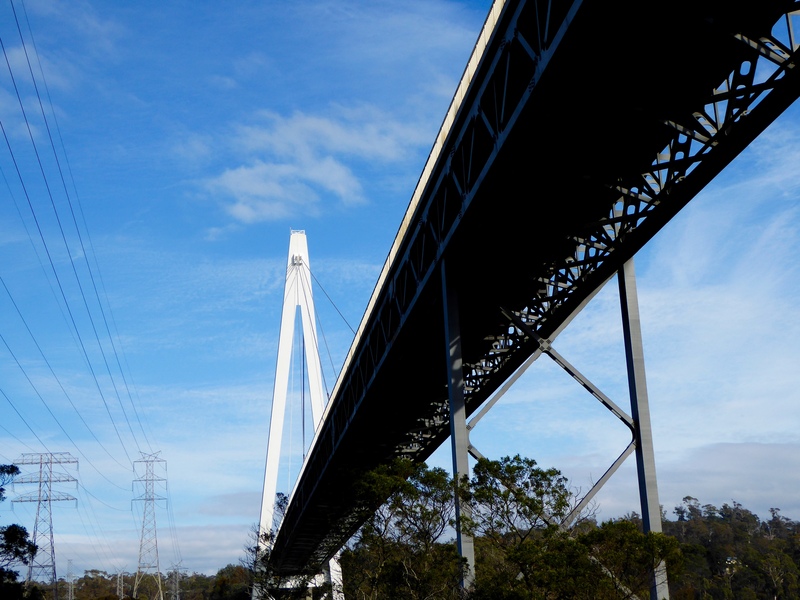 Driving over the bridge, we admired its architecture. It is getting late and we do not want to drive in the dark. 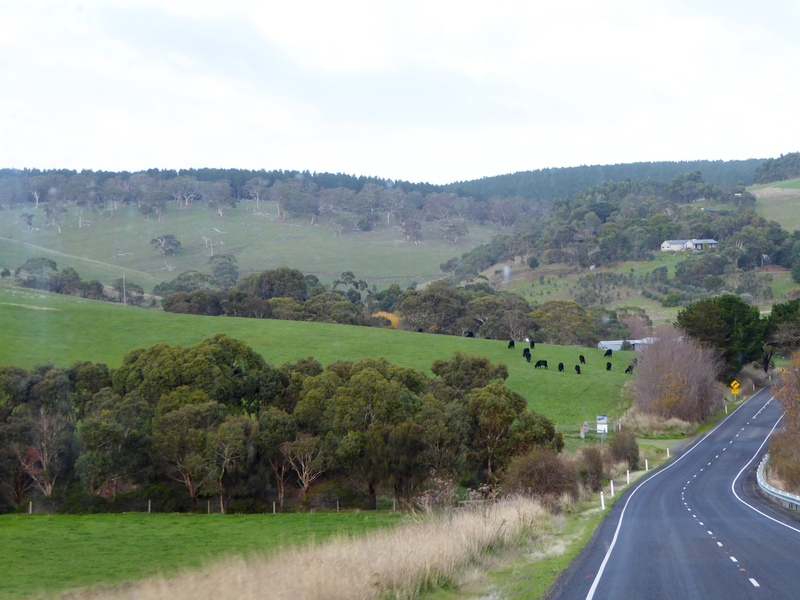 We see too many kangaroos every morning that have been hit by vehicles during the night. 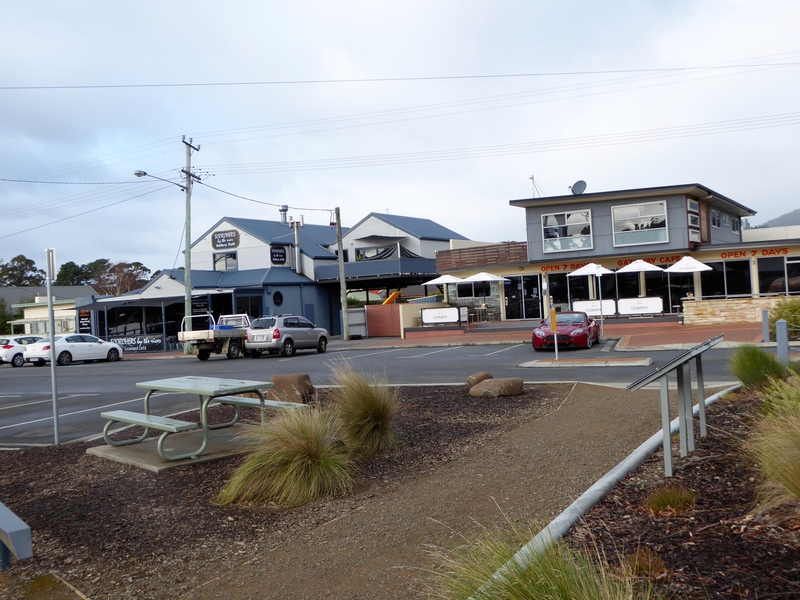 We spent the night in Burnie, Tasmania. 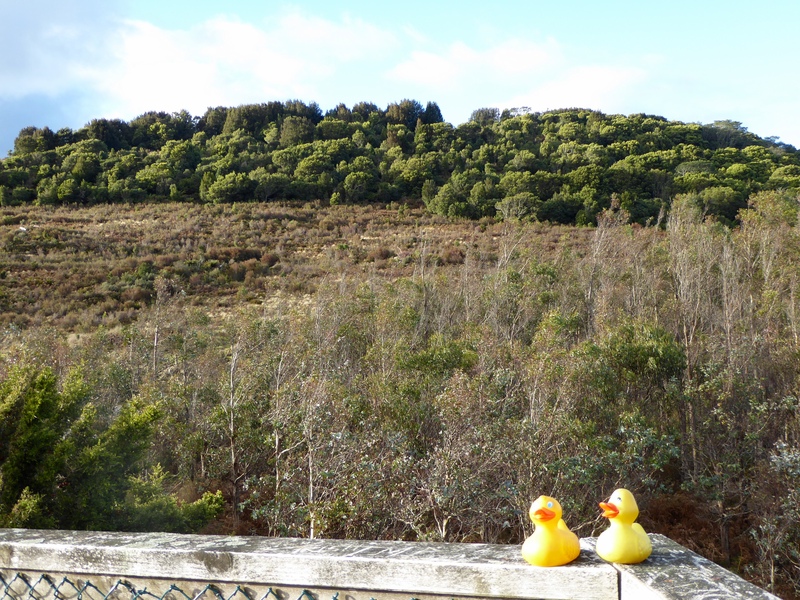 We, the Colorado Traveling Ducks and our humans, like driving round Tasmania. We think you would enjoy it also. 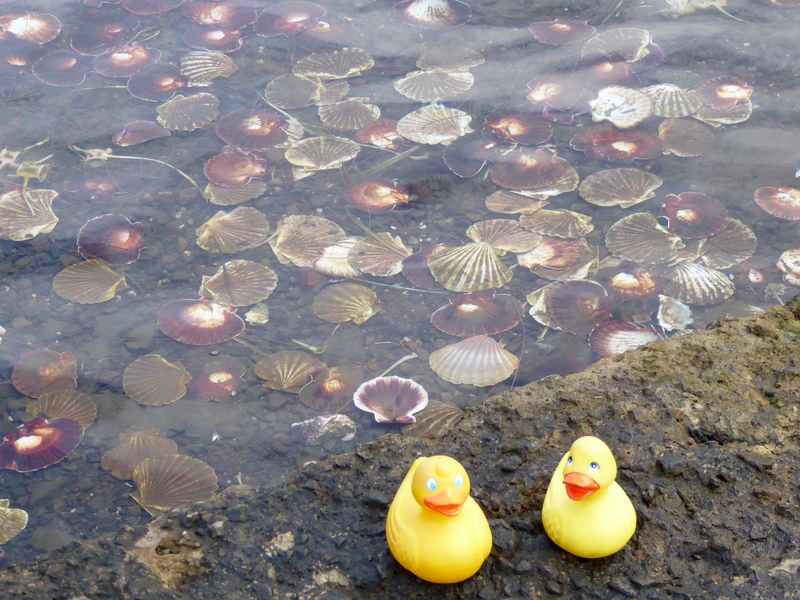 Zeb and Eider, with the humans, visited the Bay of Fire. 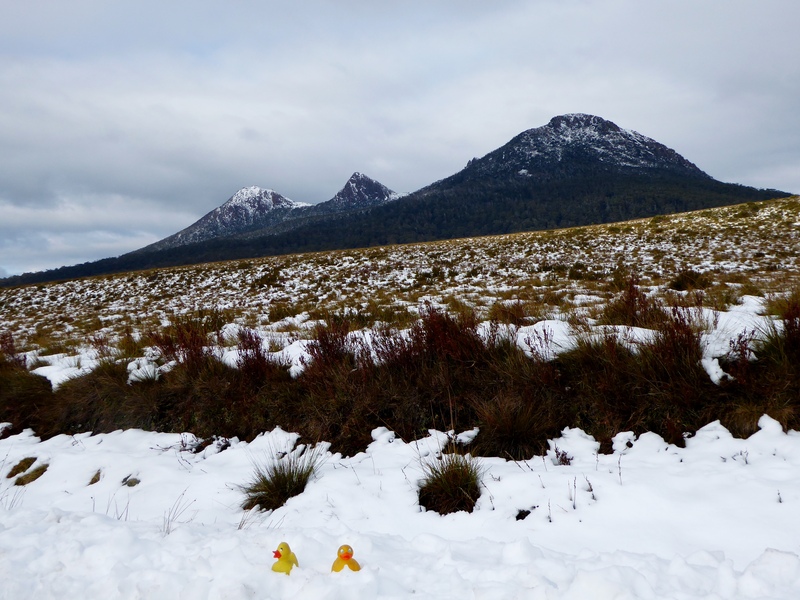 This is near St.Helens in northeast Tasmania. And there are so many rocks! 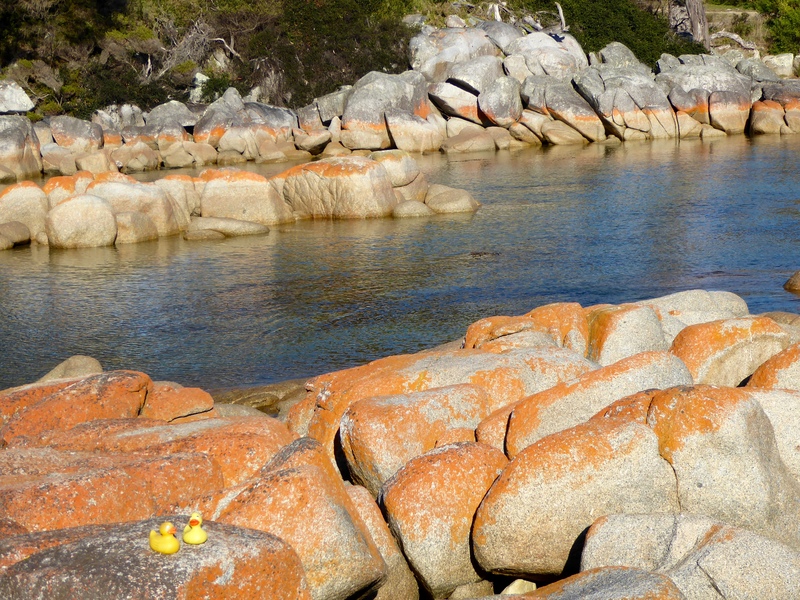 The Bay of Fires extends along the coast from Binalong Bay in the south to Eddystone Point in the north. The sand is so soft and white. Soft white sand and clear blue water. Perfect! If it were not winter and cool, we would be lounging on that perfect sand and testing the clear (probably cold) water. 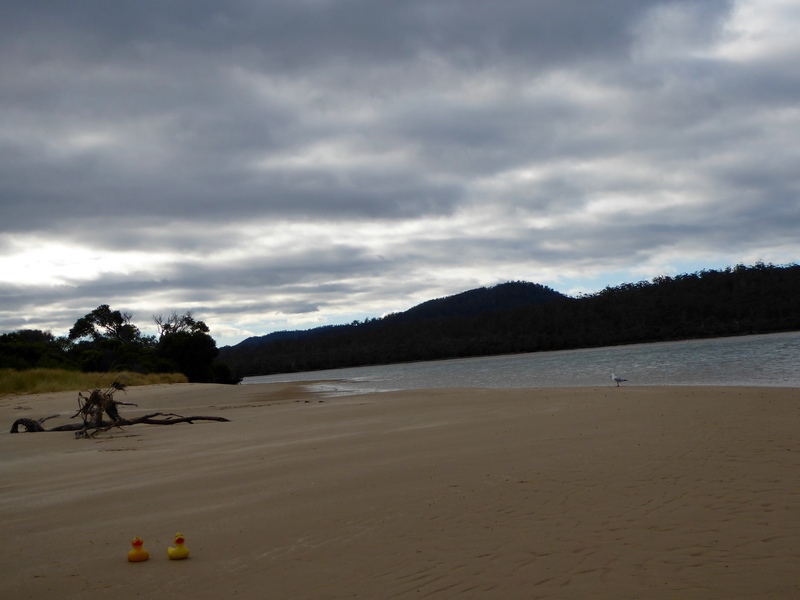 The white sand is derived from the granite bedrock that is predominant in North East Tasmania. 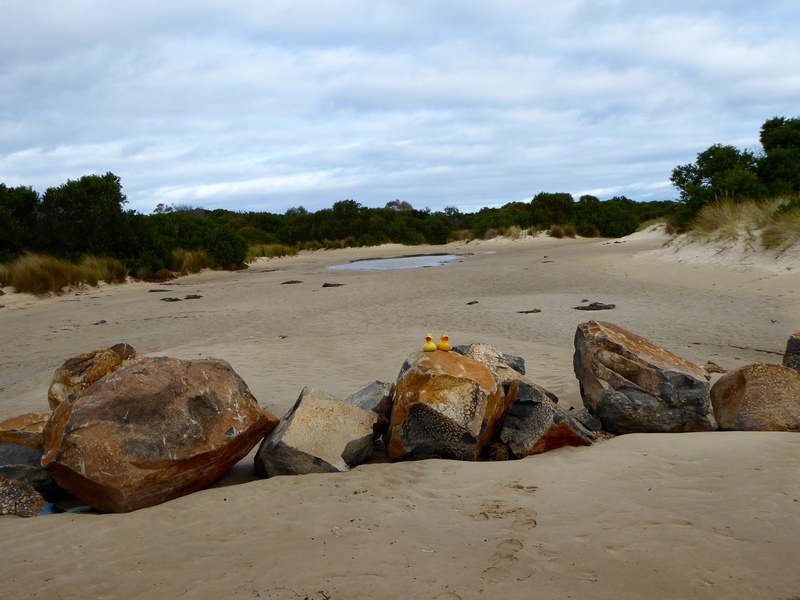 The soft white sand is because of the high quartz content of the granite boulder. 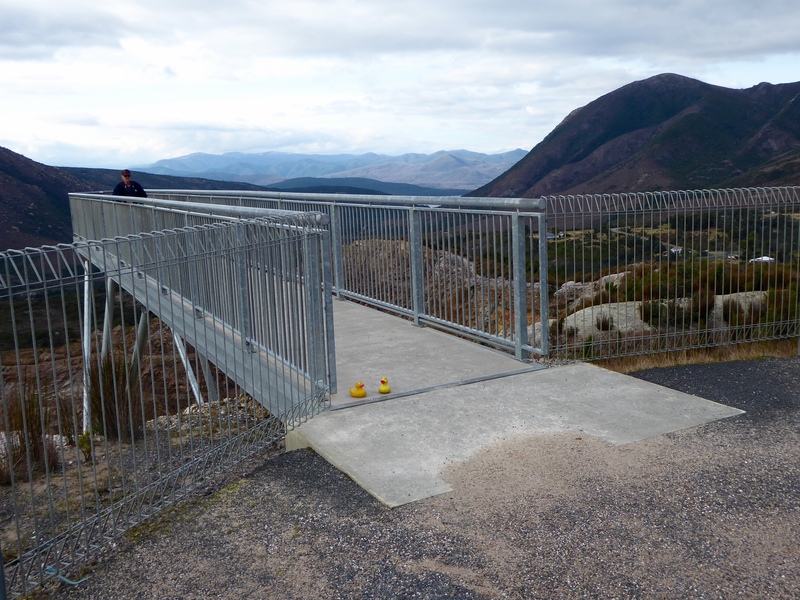 First we visited a lookout platform and then walked to the rocks. 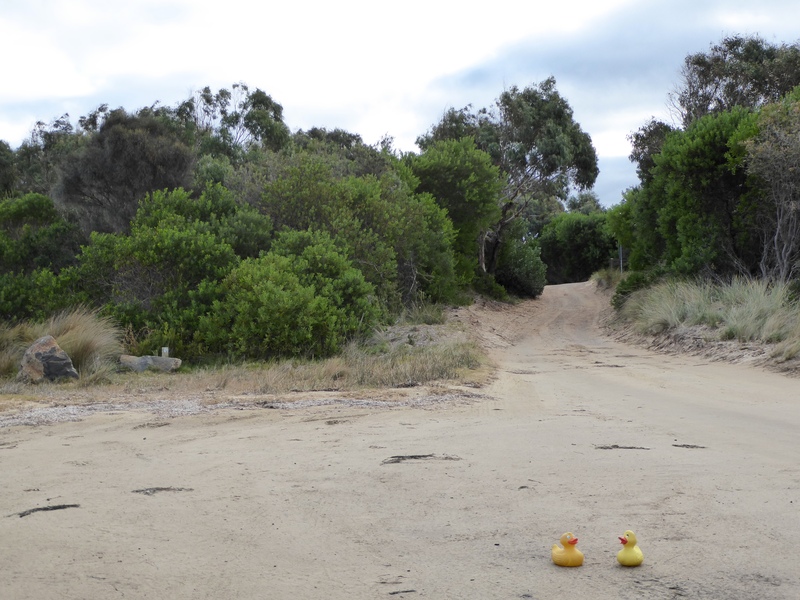 Then we drove to the The Gardens in the Bay of Fires Conservation Area. Isn’t this beautiful? 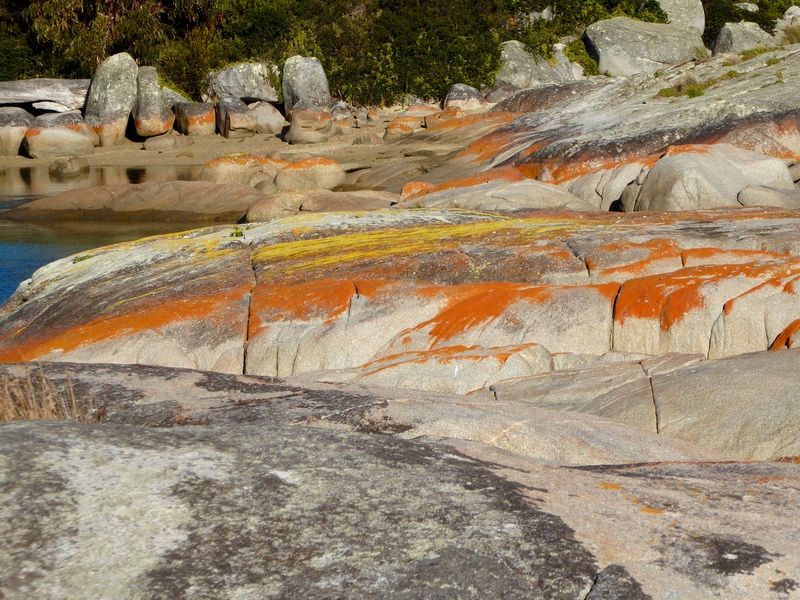 Notice the lichen growing on the granite boulders lining the bay. The bright orange is beautiful. 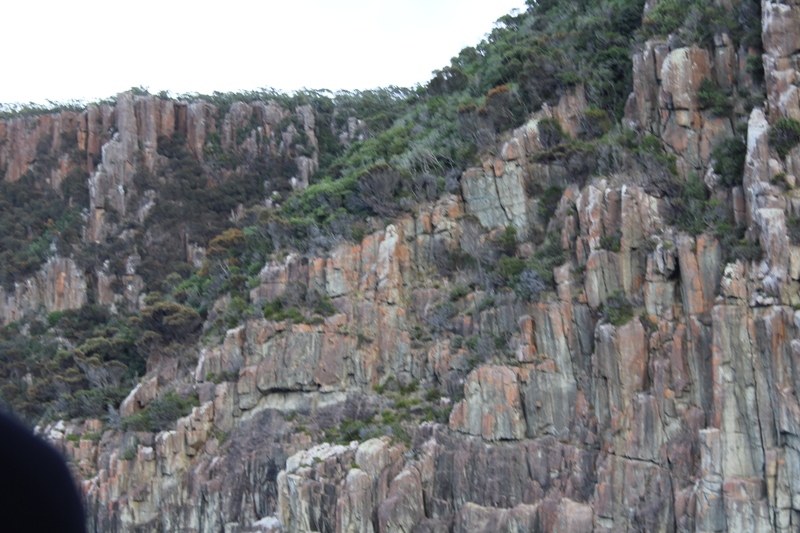 Hundreds of years ago the native aboriginal people burned this area of the island. 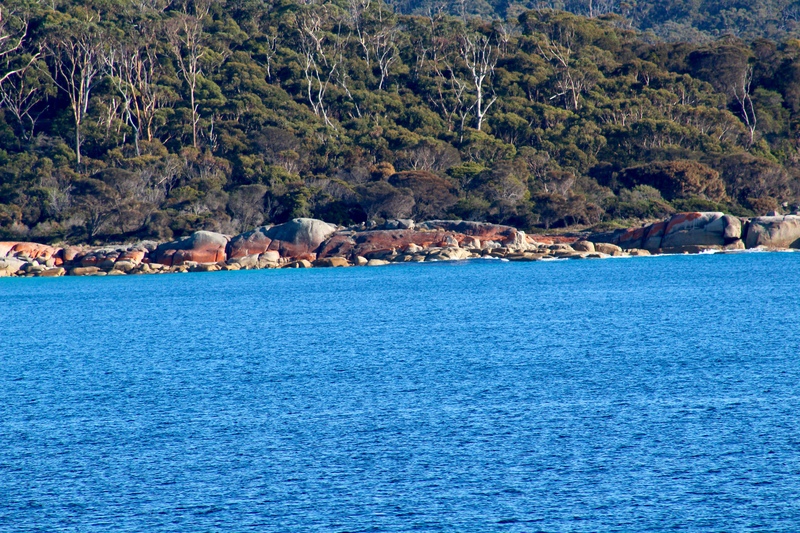 These Aboriginal fires were spotted by Captain Tobias Furneaux when he sailed past in 1773, so this area became known as the Bay of Fires. The repeated burning kept the vegetation low, giving the animals fresh young plants to eat. The low vegetation also made hunting easier for the aboriginal. The fires could be seen from far away, giving this area the name, Bay of Fire. 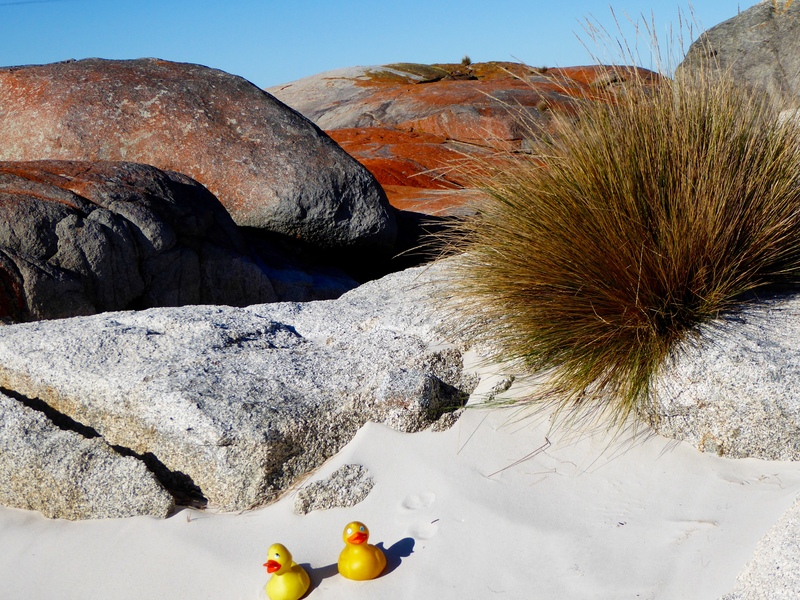 While the Bay of Fires is beautiful and serene, it does have a darker side. The coast is littered with shipwrecks. A few being the schooner Mary Ann in 1850, the brig Dart in 1865, the barque Queen of the Sea in 1877 and the fishing boat Vagabond in 1950. 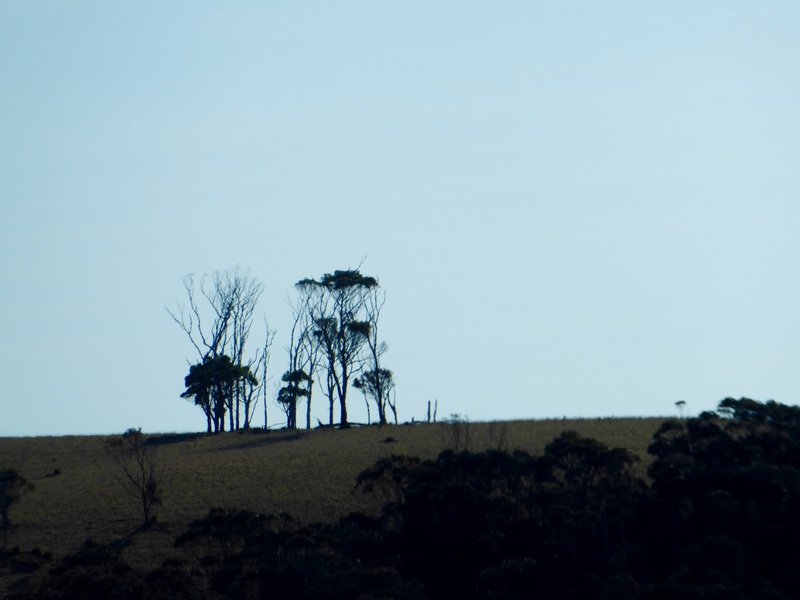 These unusual trees caught our attention. 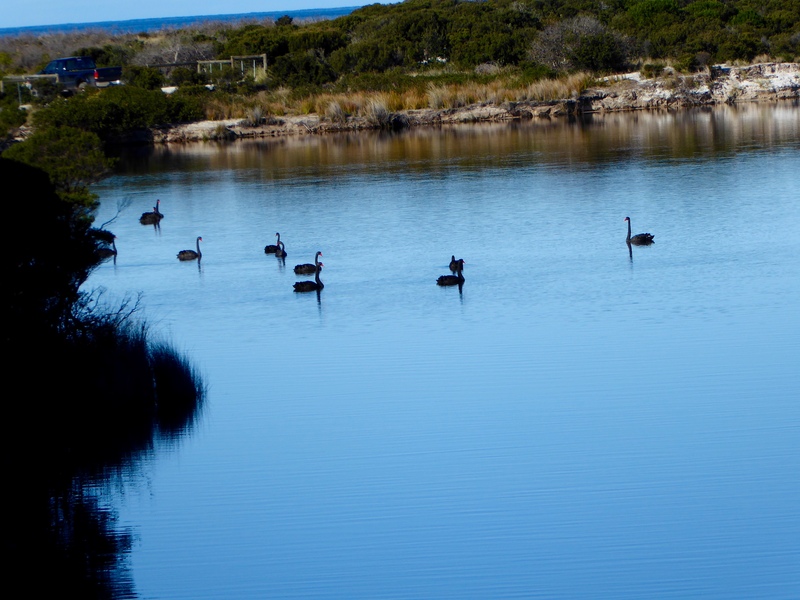 There were many Australian Black Swans in this area. 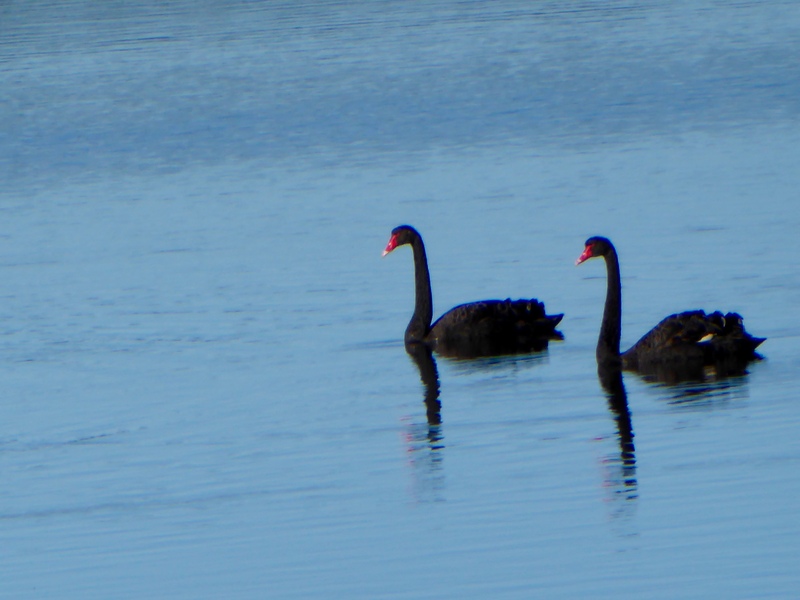 These gorgeous black swans have bright red beaks. So beautiful. 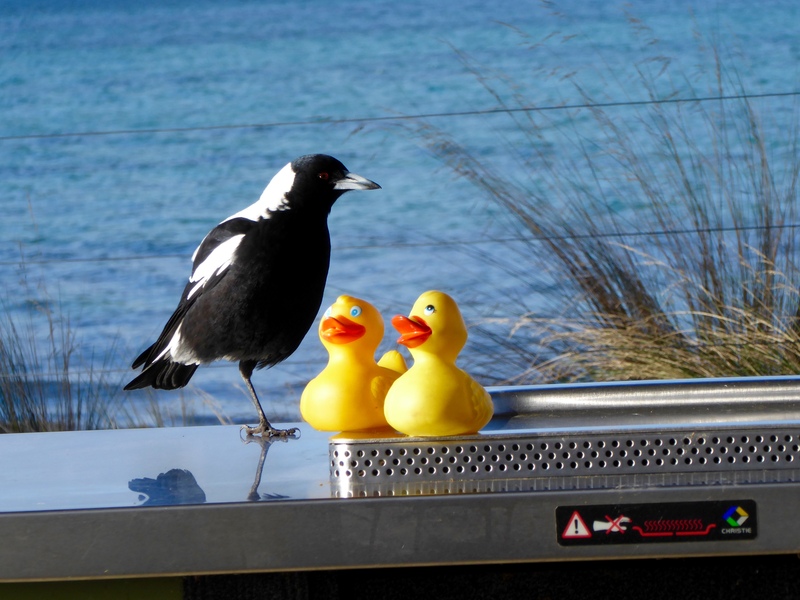 We were told that black swans are native only south of the equator. 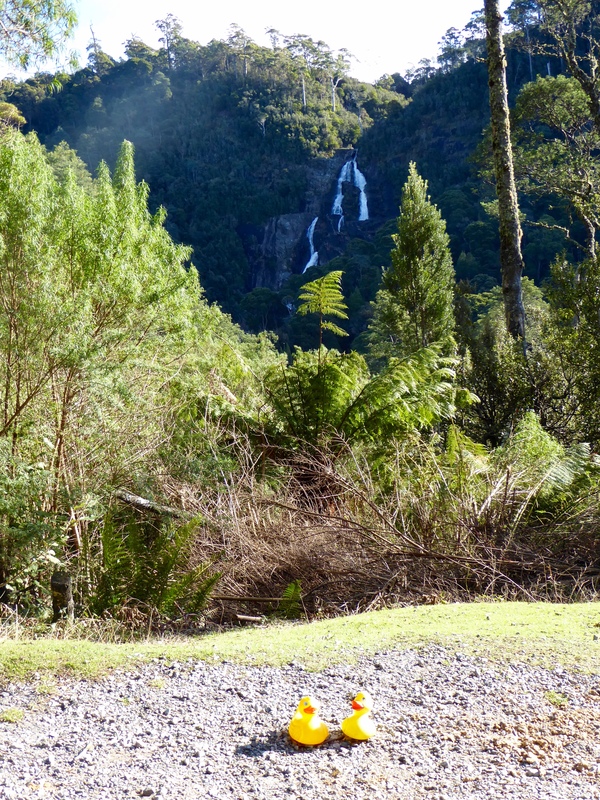 Driving about 30 kilometers west, we visited St. Columba Falls, at Pyengana, Tasmania. 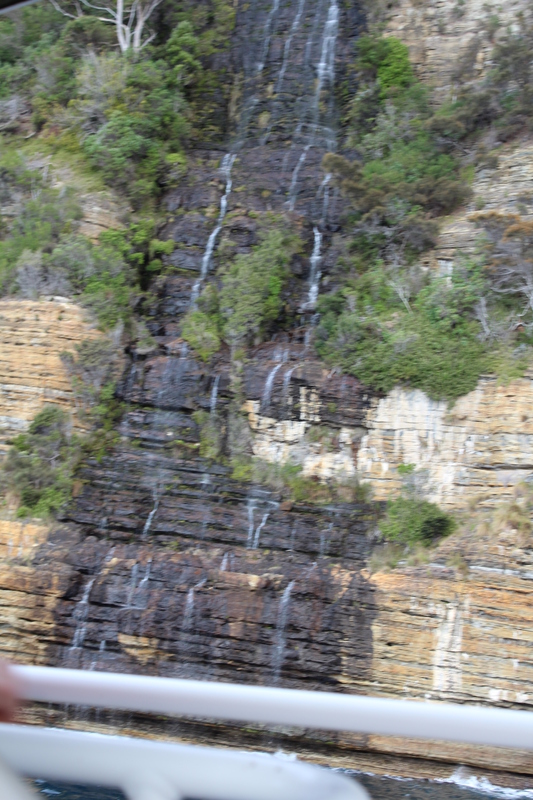 The falls are located in a rain forest. 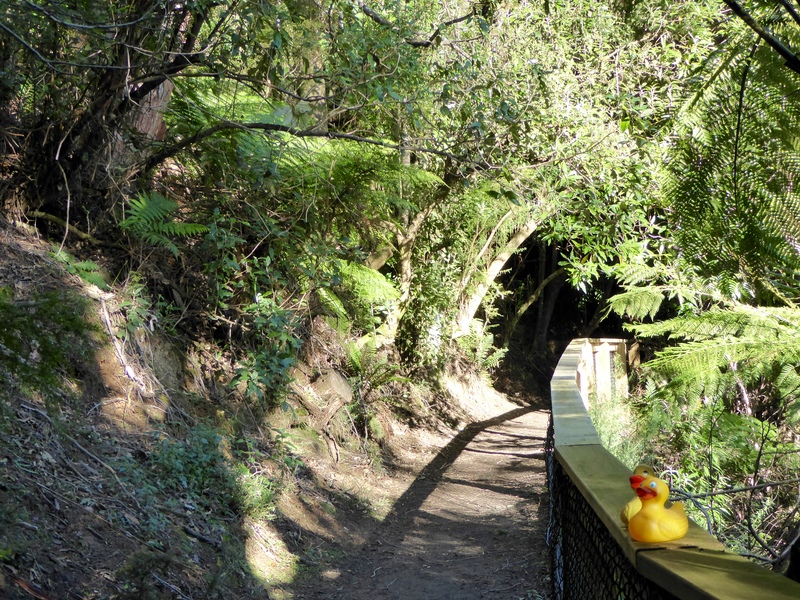 This is the path to the bottom of the falls. 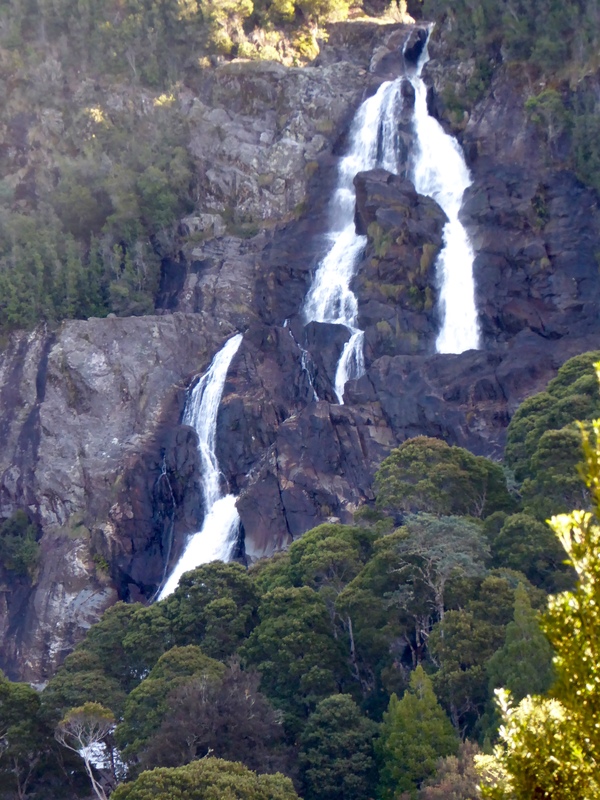 St. Columba Falls are said to be the tallest falls in Tasmania,with a drop of over 90 meters. We really liked them, too. 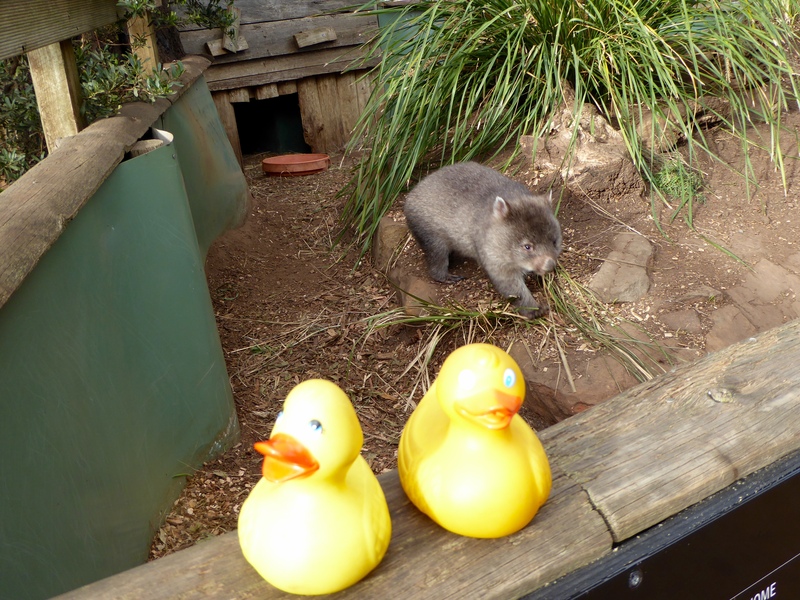 We were at Bonorong Wildlife Sanctuary between Brighton and Richmond, Tasmania. 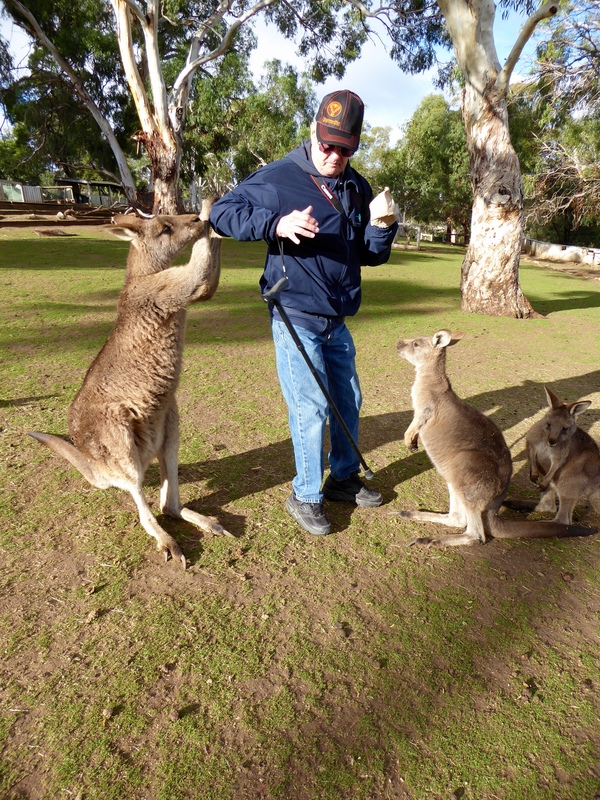 When we entered this sanctuary, each human received a bag of kangaroo food. 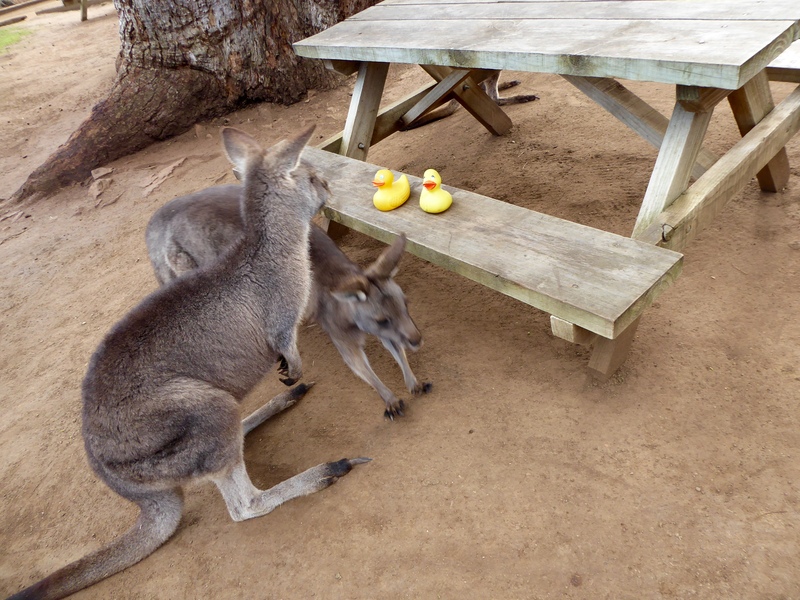 The kangaroos were waiting for us and looking for the food. Aren’t they so cute? Soon the wildlife tour began. 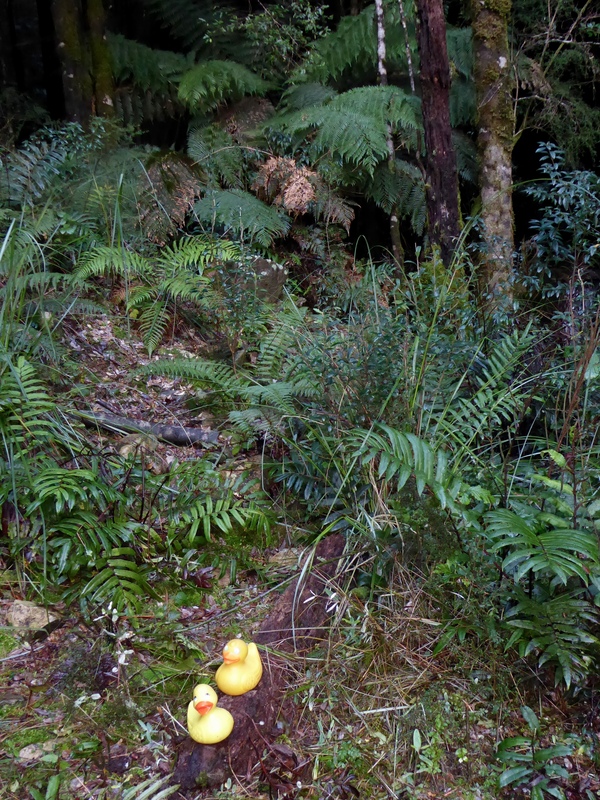 We first saw a wombat. These guys are strong, fast and not afraid to give a nasty bite if they want to be left alone. 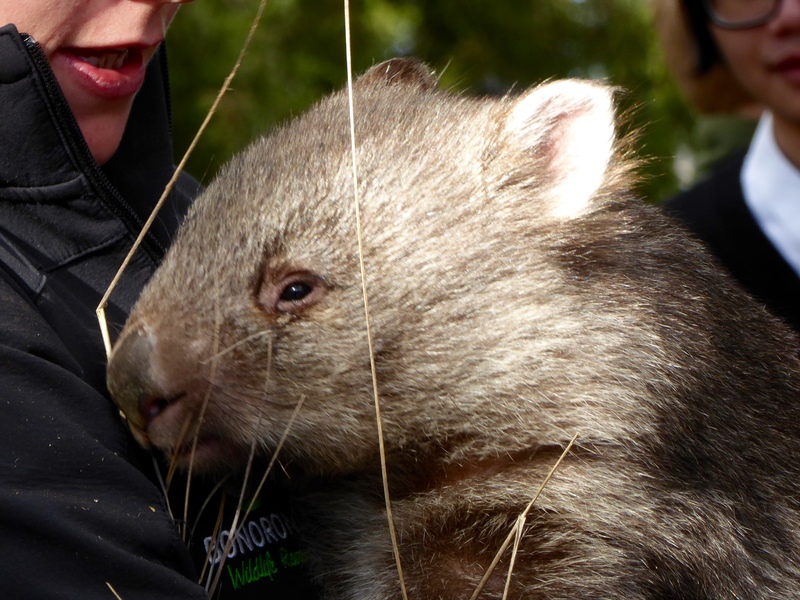 Wombats live in burrows, and if a predator tries to enter, the wombat will allow the predator to touch his rump, and then the wombat will raise his rump and crush the predator against the roof of the burrow. Wombats have broken human hands this way, also. Here is another strange fact about wombats. 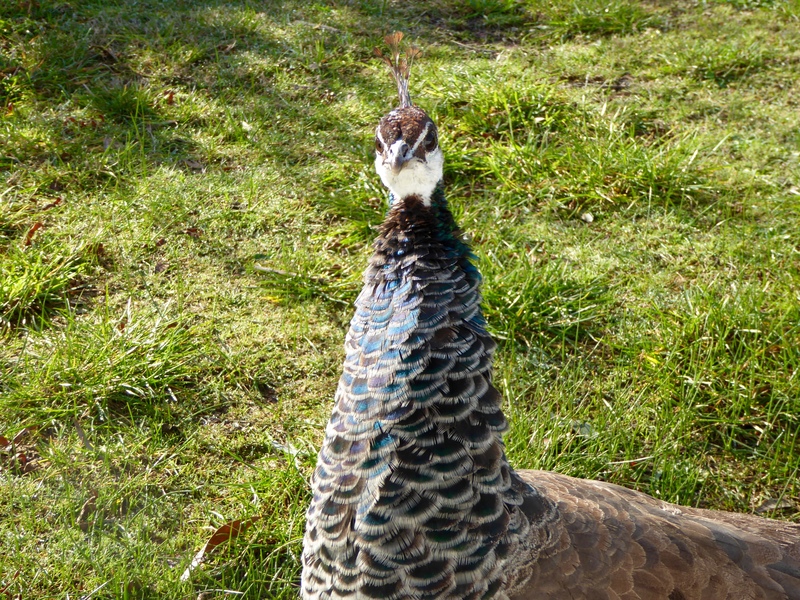 They have square poop which they place on elevated surfaces to mark their territory. The square shape stops the poop from rolling away. 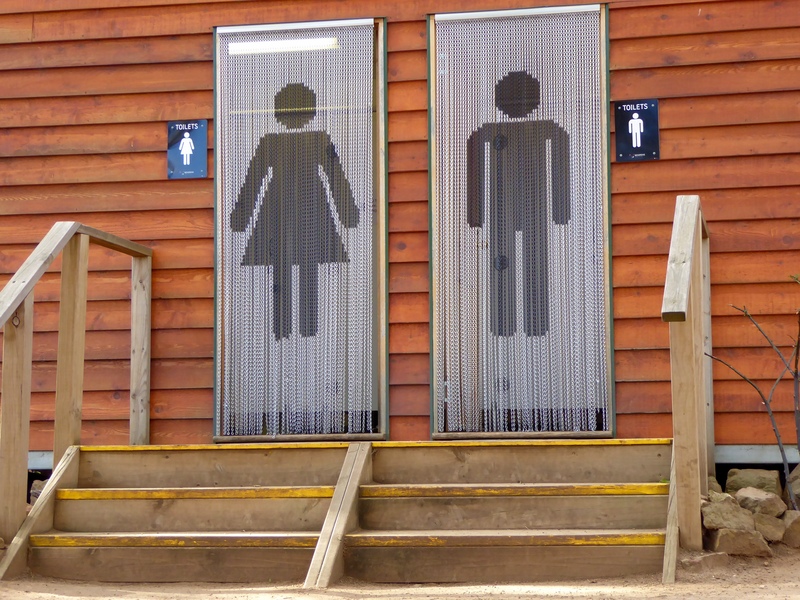 Scientists know they have square poop, they just don’t know how they make their poop square. 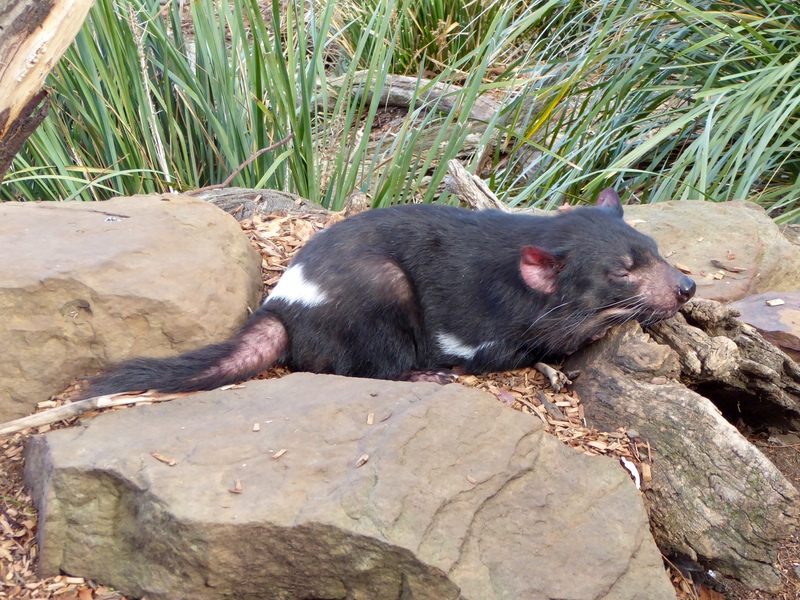 Next we went to see the Tasmanian Devils. 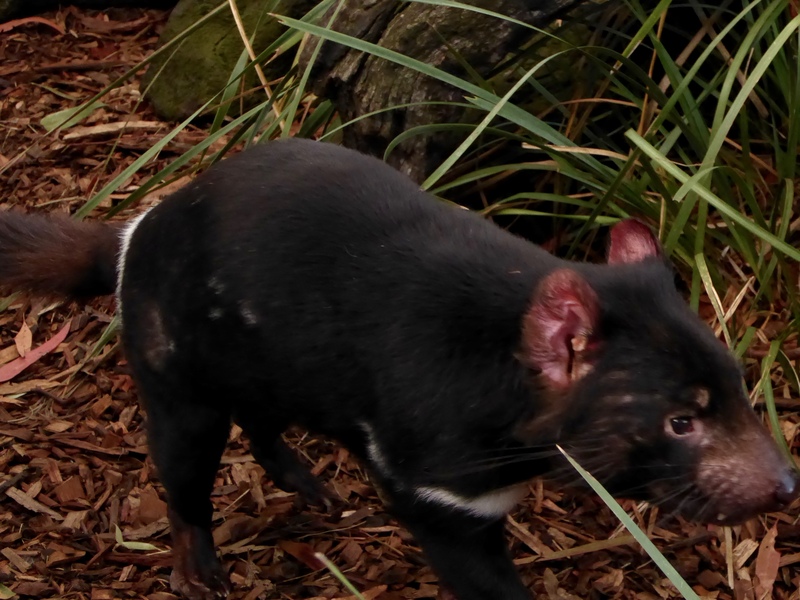 The Tasmanian Devils were the main reason for visiting Bonorong Wildlife Sanctuary. 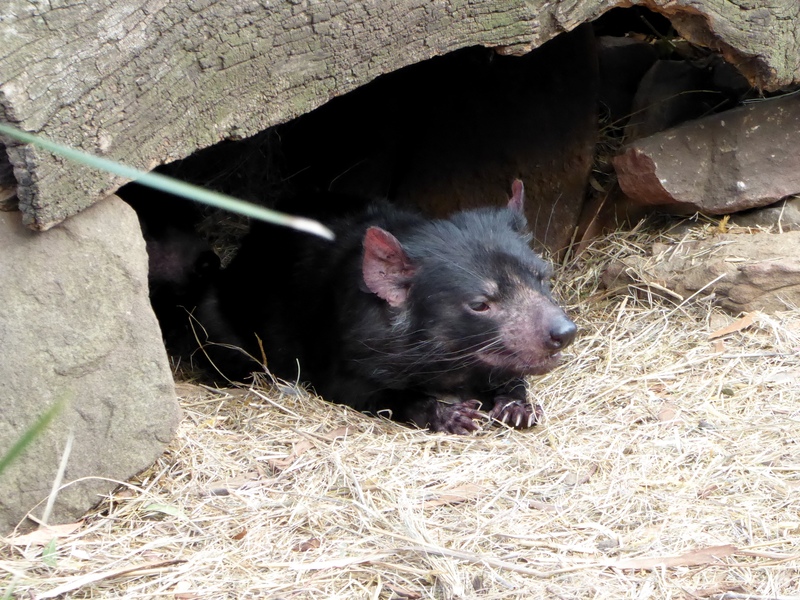 The Tasmanian Devil is threatened because they have a rare form of contagious cancer. They have Devil Facial Tumor Disease (DFTD). So far there is no known cure for this disease. These devils have a bad reputation because of the shrieking noise they make when eating. The devils we saw were kind of cute. This one kept running around his enclosure. One was in his tree, almost sleeping. 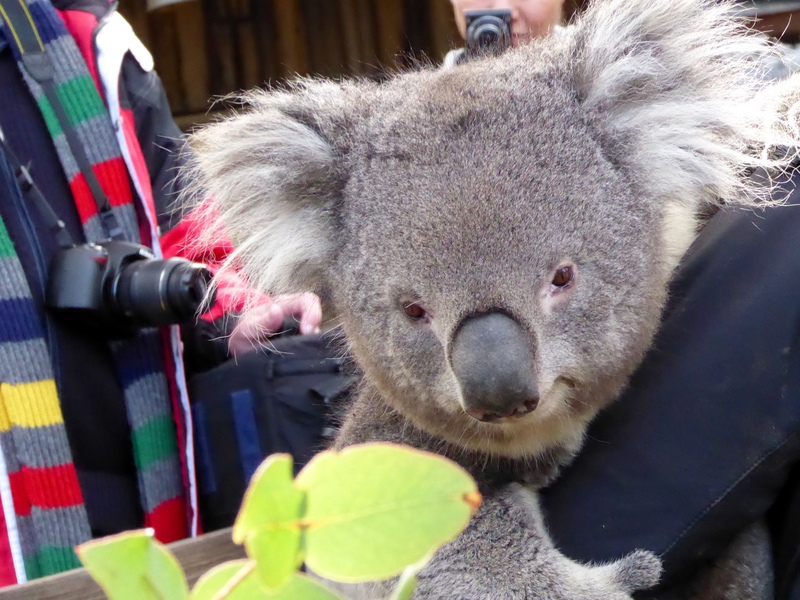 The koalas were so cute, but they don’t move much. 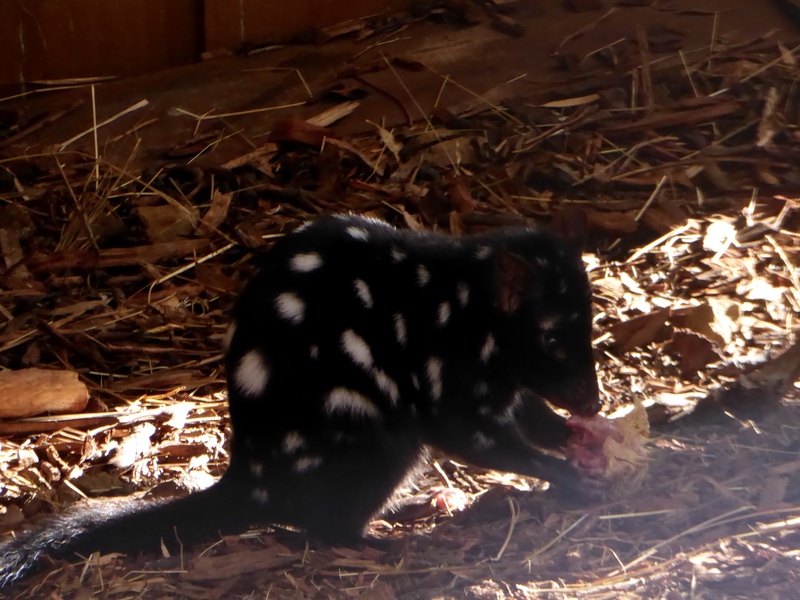 This is a spotted tailed quoll. He is having a snack. There were also brightly colored birds. 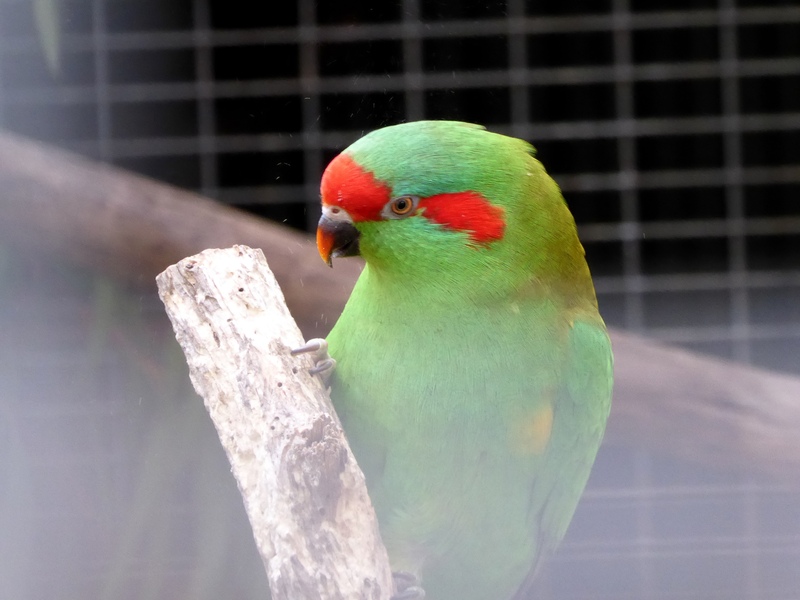 We liked the Musk Lorikeet. 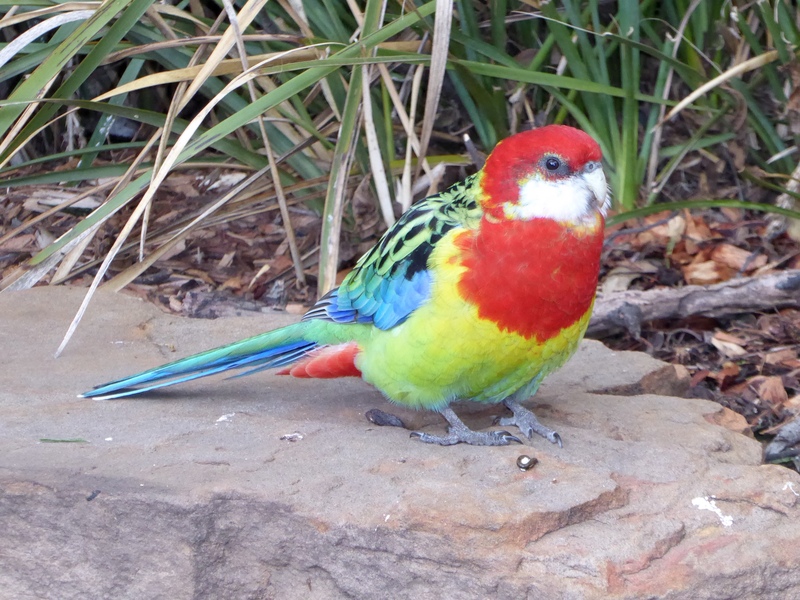 This is the only Lorikeet native to Tasmania. 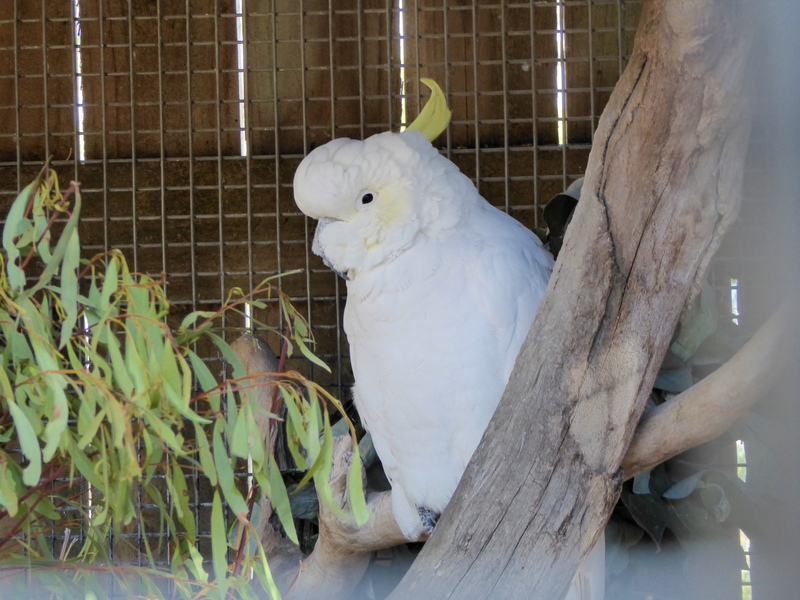 The sulphur crested cockatoo is beautiful. 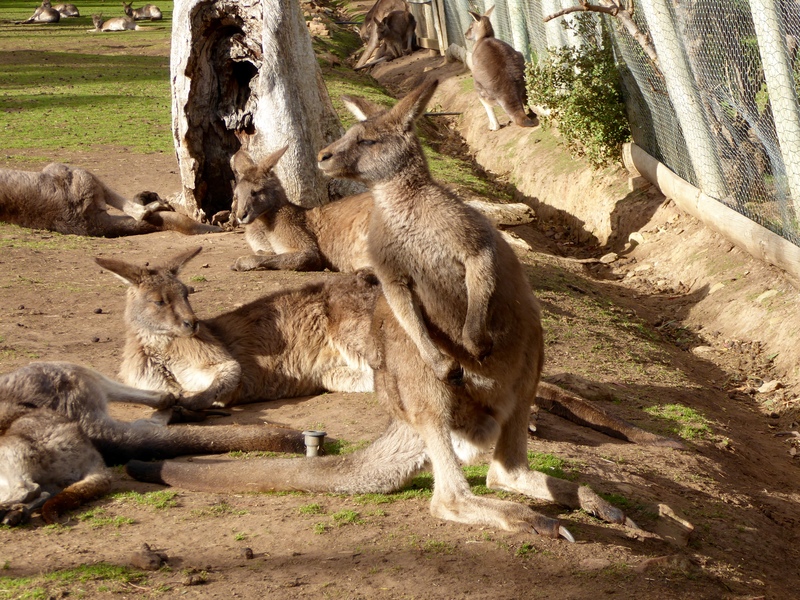 We saw many birds and other small animals, but the kangaroos were certainly the stars of the day. 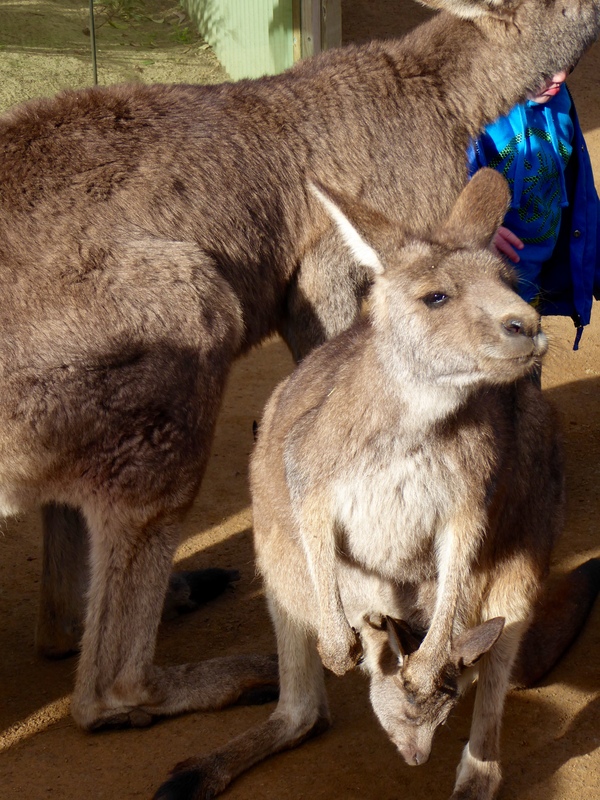 This one has a baby, or joey in her pouch. 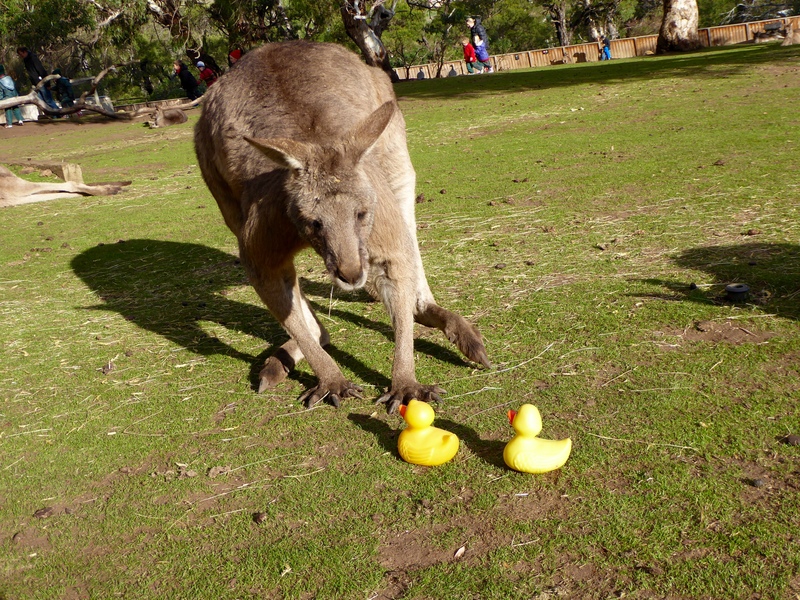 We think this kangaroo is our new friend! 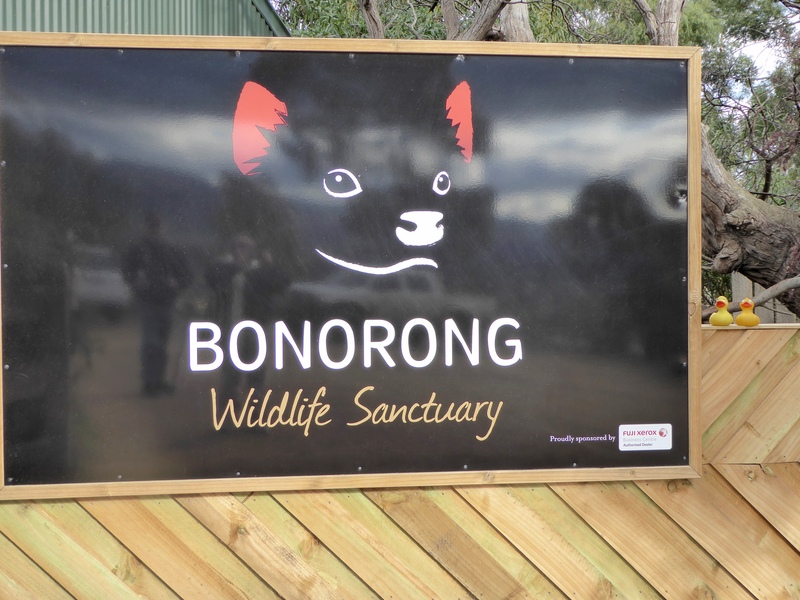 For more information visit http://www.bonorong.com.au You will love this place. When the humans need a break, this is the place. 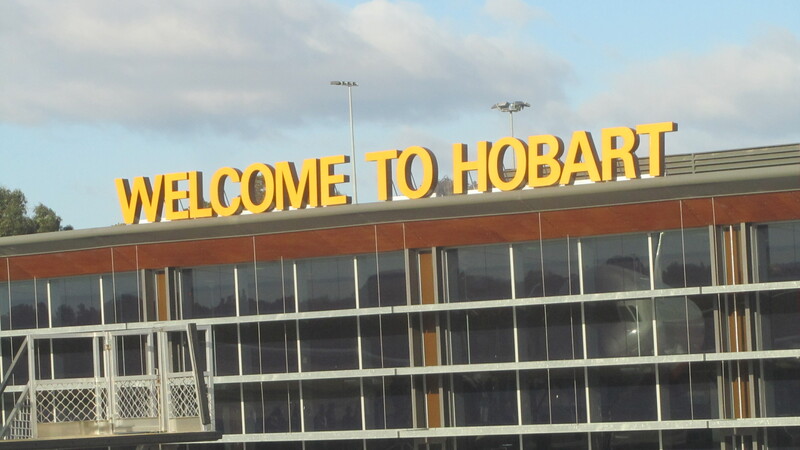 We are now in Hobart, Tasmania. 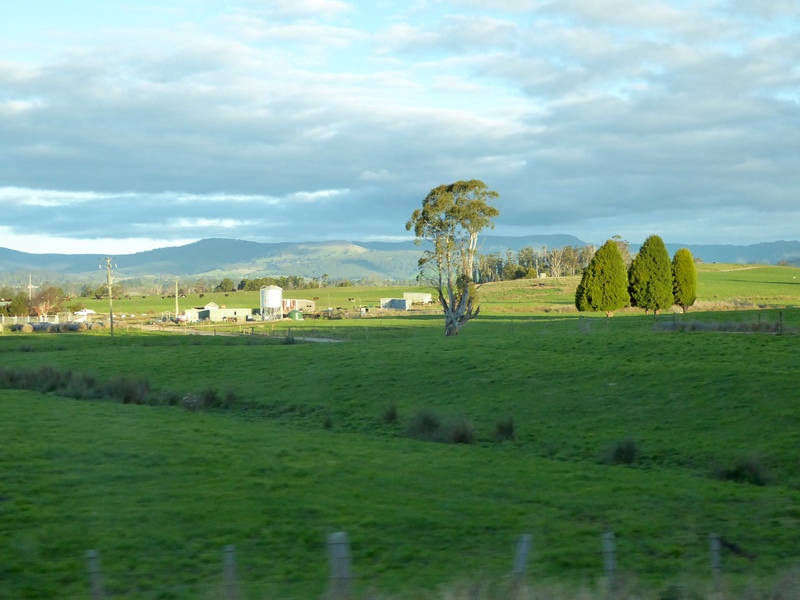 Tasmania is the largest Australian island and the most southern Australian state. 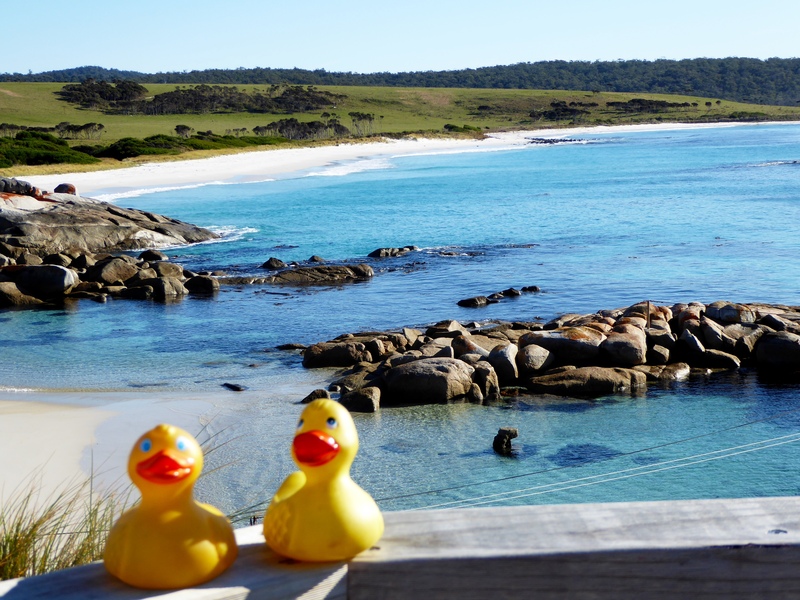 Today we are going on a cruise in Tasmania with Pennicott Wilderness Journeys. 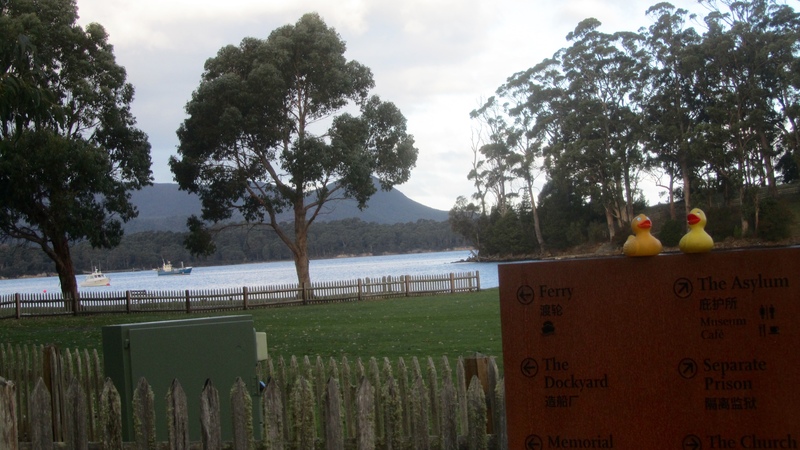 We arrive at the docks in Hobart and then ride a shuttle to the boat dock near Port Arthur. 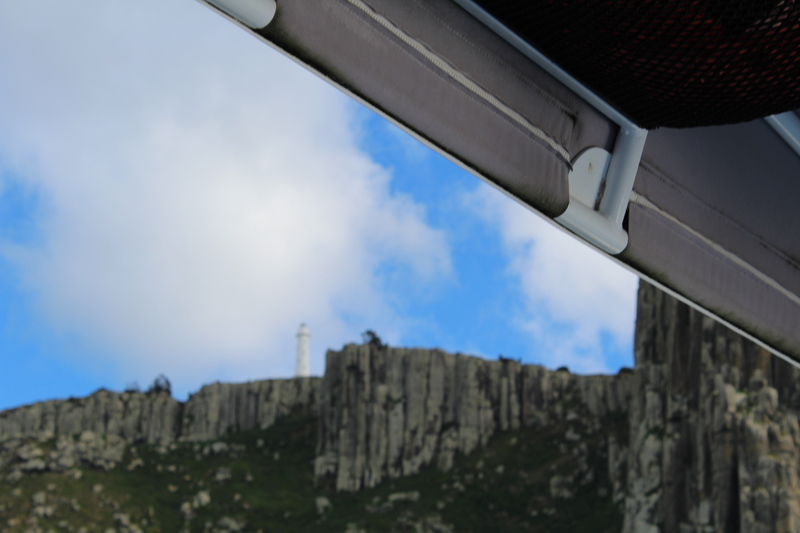 We are cruising to and around Tasman Island. 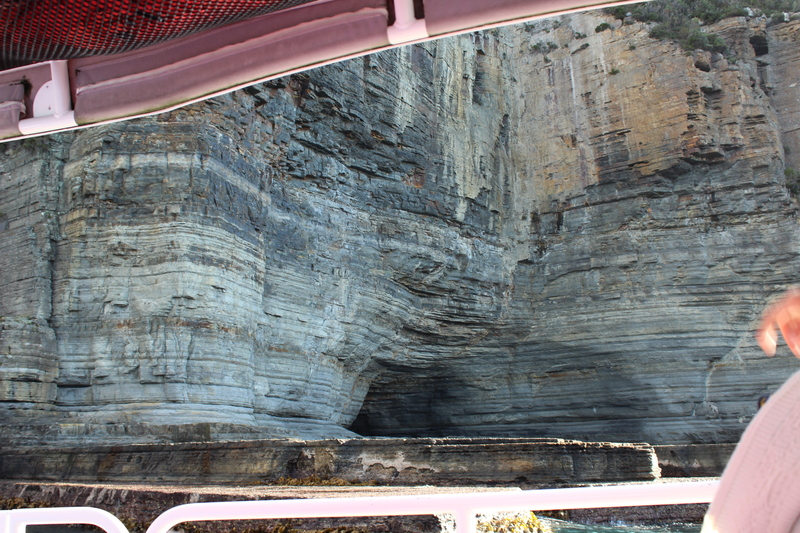 We will not get off the boat, but we are excited because we will see amazing cliff and rock formations. These rocks are millions of years old. 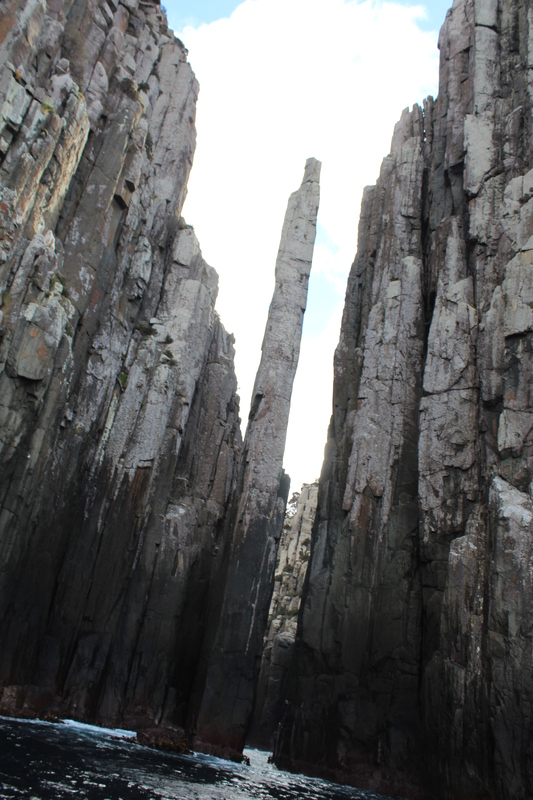 Here the rocks shifted during volcanic activity. 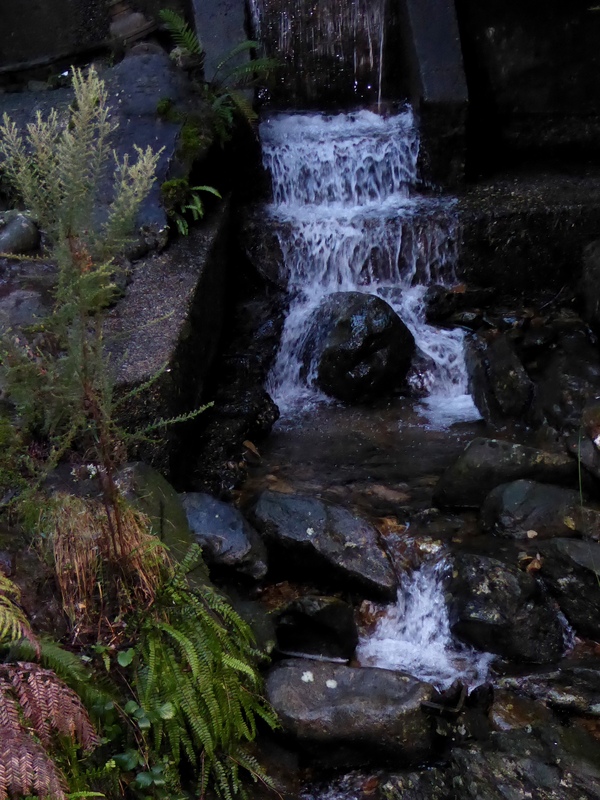 The shifted rocks make it look like the water is running downhill. It is not! Now we are inside a cave. 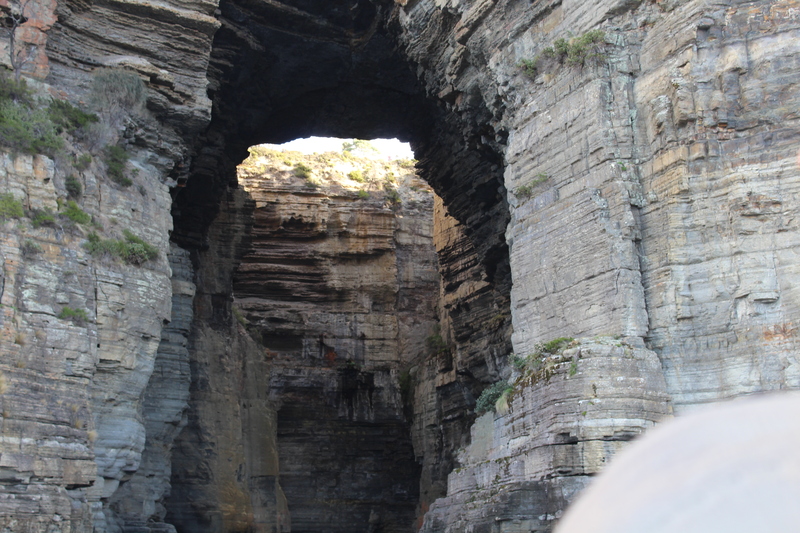 Our boat is inside a cave. This is exciting for the Colorado Traveling Ducks. We love waterfalls. This is great! This is the totem pole. It is a favorite for experienced rock climbers. Here we are at Cape Pilar. 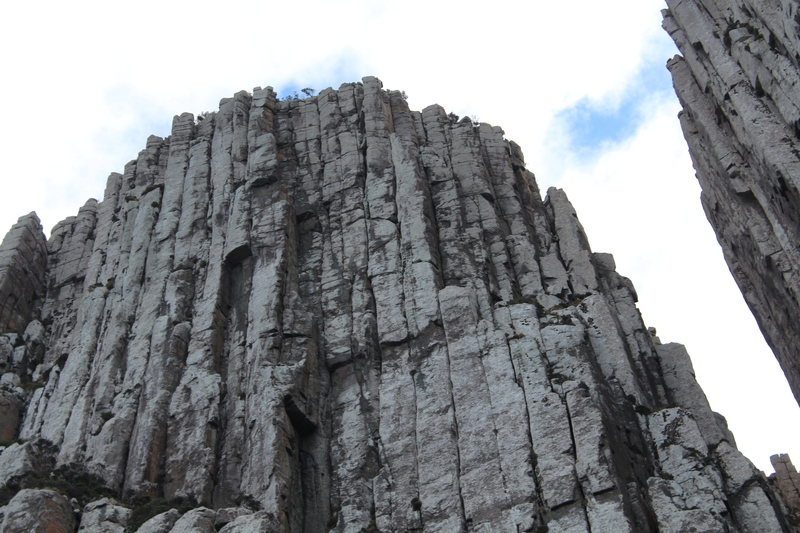 We are seeing some of Australia’s tallest rock cliffs, while we are in Tasman National Park. 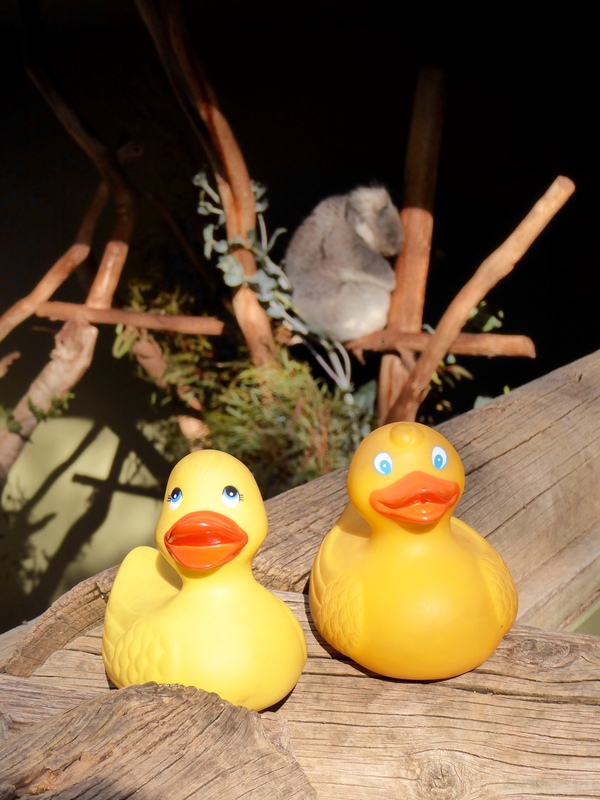 We ducks are on this cruise, but the caption said we could not sit on the rails; we must be out of the wind and surf. 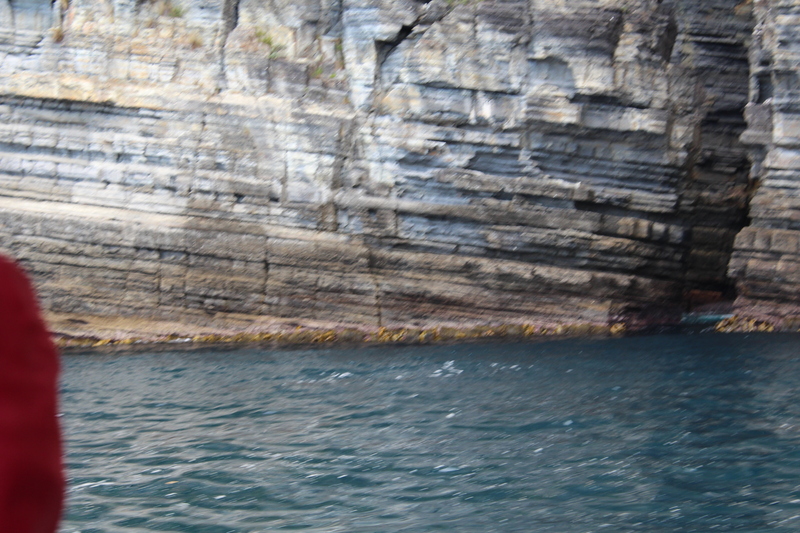 We love this cliffs. We are in our travel bag. 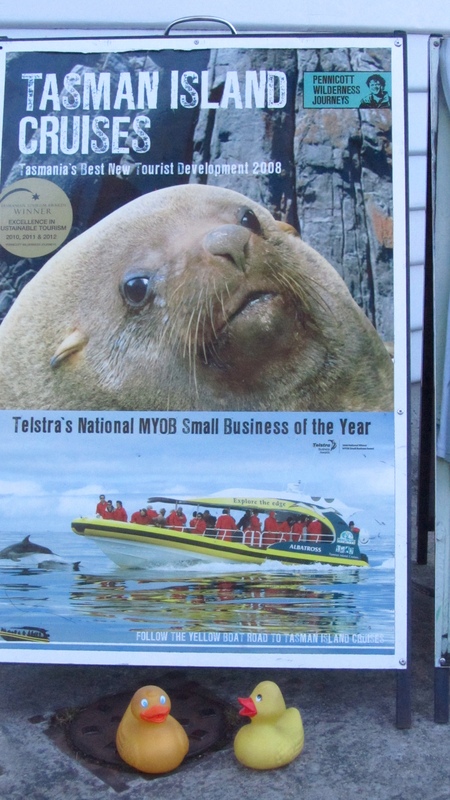 Next is Tasman Island. There is a lighthouse at the top. 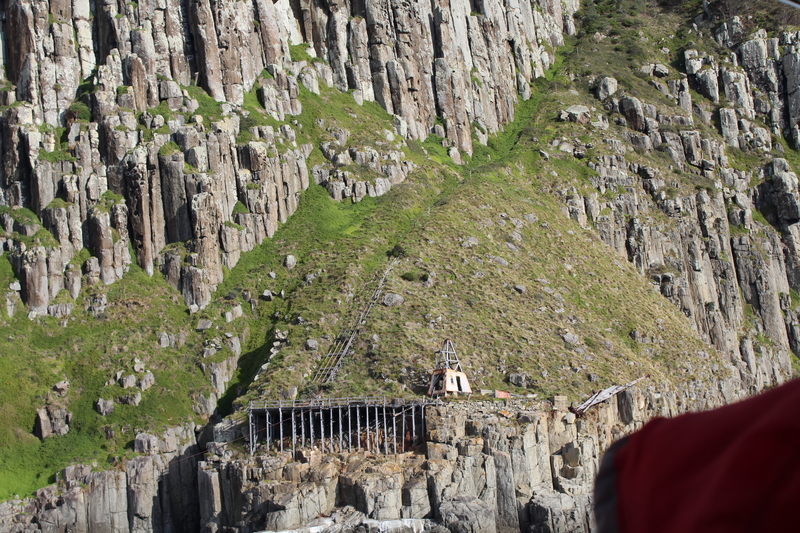 Here is the pulley system used to get people and supplies to the top of the island and the lighthouse and also to bring supplies and people from the top to the boats so they can leave Tasman Island. On the way back to the rock, the weather changed. The clouds came and the wind also increased. The ride back was a little rough, but we loved it. 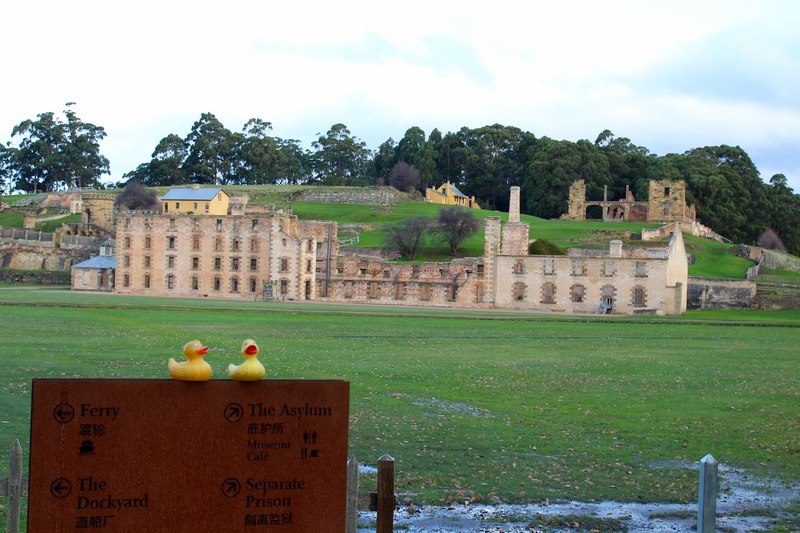 Our next stop for the day was at Port Arthur. 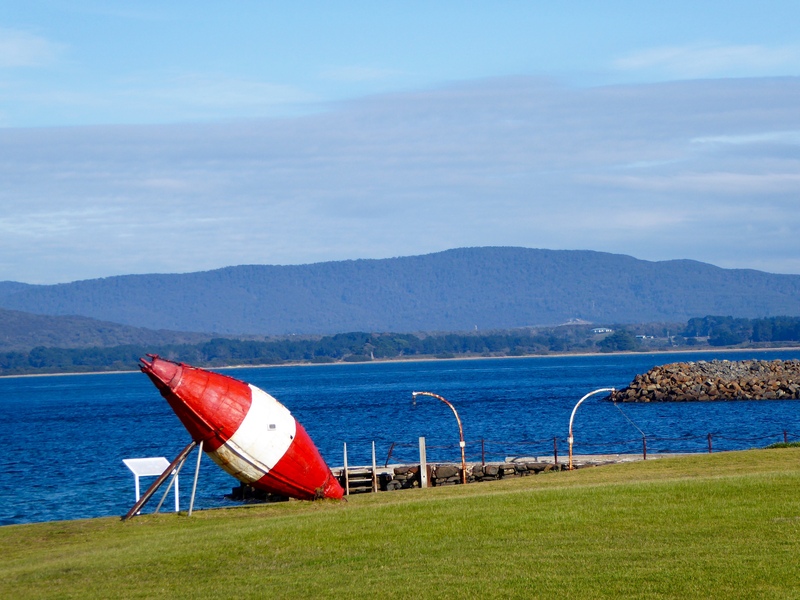 Port Arthur was a brutal British prison from 1832 to 1877. Now it no longer functions as a prison, but many buildings remain. We walked around the grounds. The setting is beautiful.